I've said before in other reviews of Xinjiang restaurants...it's all about the lamb. 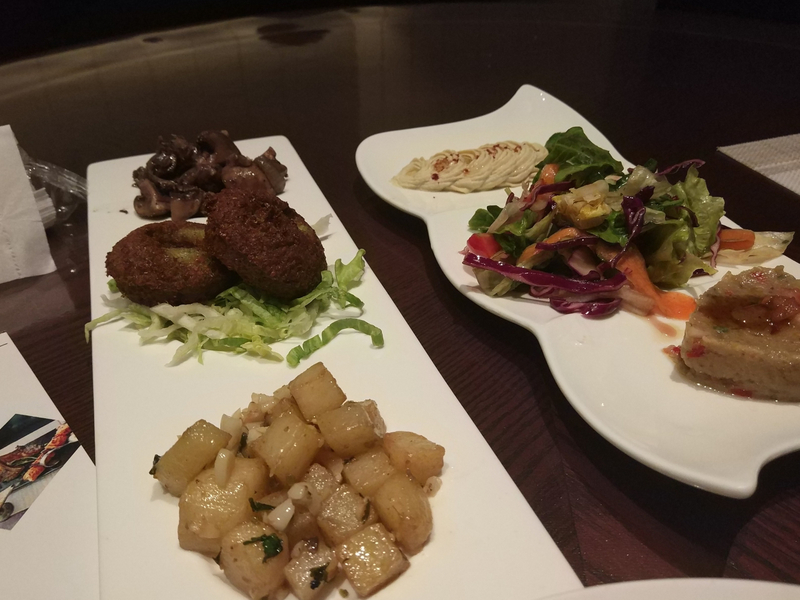 Sapar Uyghur Restaurant delivers on the lamb, doesn't let down on the "side dishes" (i.e. 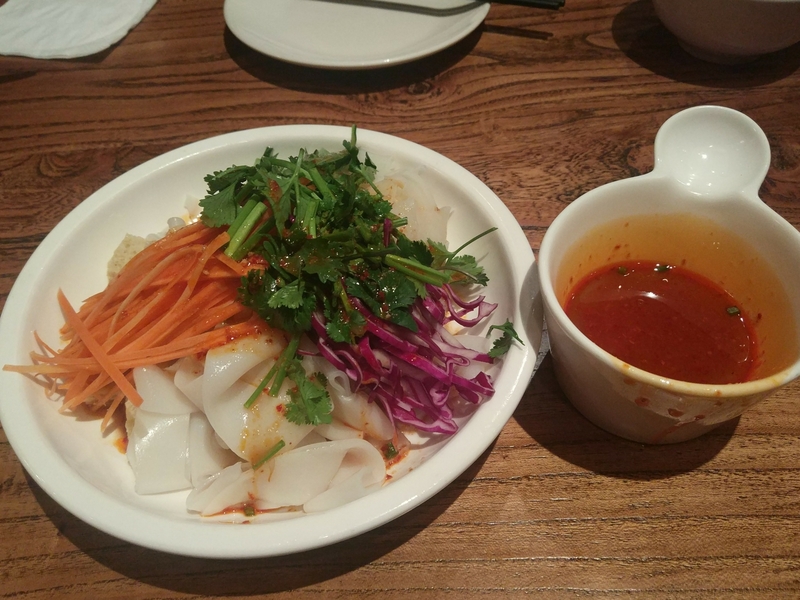 everything that's not lamb), and overall delivers the Xinjiang cuisine restaurant experience I'm looking for...in a convenient central Jing'an location! Everyone wins! 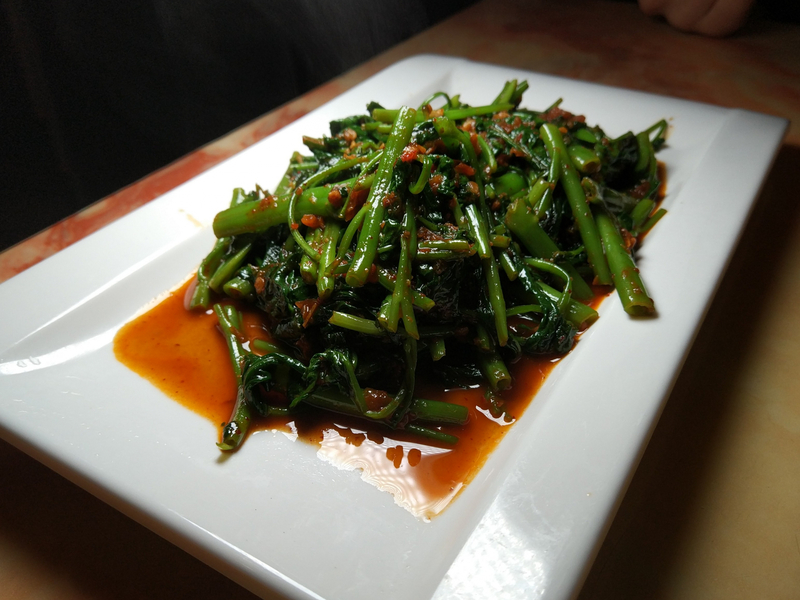 gan bian si ji dou: Wok-fried green beans with chili and garlic. Classic dish that you can almost never go wrong with. Sapar's was pretty tasty, although I wasn't crazy about the sprinkling of MSG crystals that the chef seems to have added too late into the wok. I like MSG, but I like it to be dissolved into the dish, not appearing as little crunchy crystals like sesame seeds. 3/5, but only because of the MSG crystal thing, which was weird. Overall, Sapar ticked all the boxes for me when it comes to Xinjiang food. I will be back. Price was good too, something like 242 CNY for all the food mentioned above (a feast for 2). Trendy Singaporean cafe in a Xintiandi mall. What to expect...? Great laksa? Perhaps surprisingly, also check. I don't know why I thought it wouldn't be good. Maybe because the menu is 80% Western food with only a smattering of Asian cuisine? Maybe because it looks like the kind of place where the attention to the instagrammability of the decor would take precendence over the cuisine? Maybe because I'm biased against trendy cafes that wealthy Shanghai twenty-somethings are willing to line up for over an hour to nibble on 60 RMB cake while zoning out on their phones? Truffle oil fries: Huge serving, very strong truffle oil flavor, very tasty, but flavors didn't match anything else we ordered (our mistake). Just be aware this dish is huge, and the truffle oil isn't a good partner for everything else. Pumpkin soup：Not very good...pumpkin flavor was weak, not very sweet, and the other flavors in the dish (ginger, coriander) seemed confused and at odds with each other. Fortunately it was inexpensive (38 RMB). Suggest avoiding. Laksa: Standout of the meal. Fairly pricey for a bowl of noodles, at 98 CNY, but with generous portions of crab meat and authentic, rich Singaporean/Malaysia flavor, it's difficult to complain. 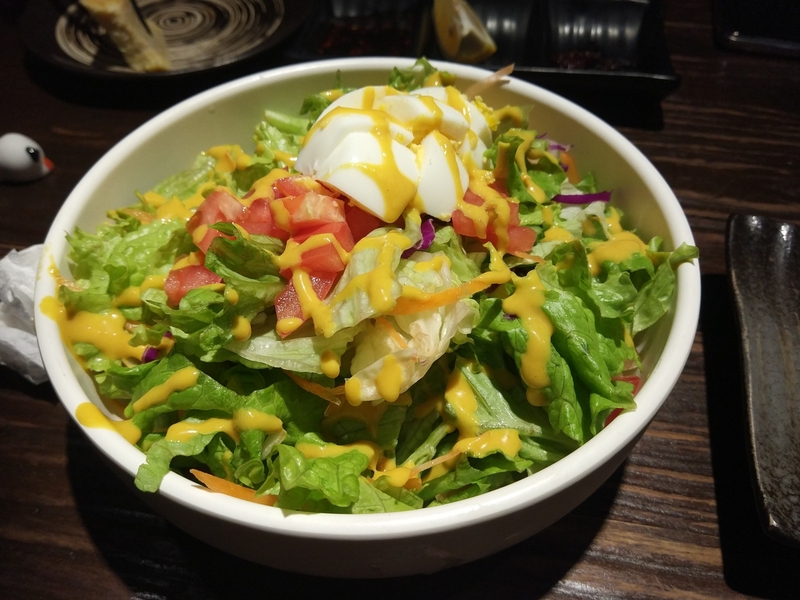 Samsui Chicken salad: Was fine, could have used more dressing. It seemed like the last few bites were much better than the first few, because the dressing had finally totally coated the lettuce and other salad parts. 78 CNY ind of epensive for what it was. Overall, 4/5, because there were some hits but also some misses. I'd definitely return for the laksa - this is the best I've had in Shanghai thus far. The decor is worth a mention - black and white, very trendy. A commenter on Bon App said it looked exactly like the Raffles Hotel in Singapore...maybe that's the aesthetic they were going for? I don't know how fair it is to evaluate a restaurant on Valentine's Day. 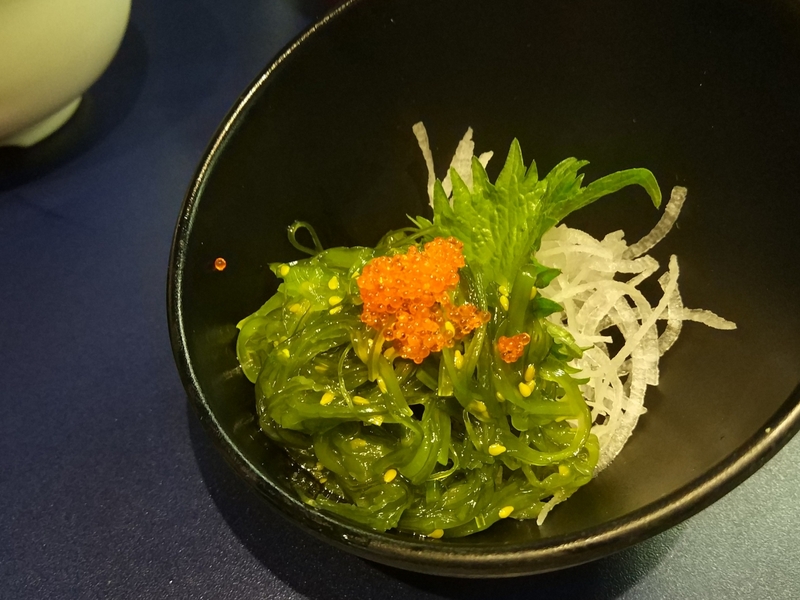 Usually, they'll have a special menu that the chef and servers may be unfamiliar with, they'll be far busier than they usually would be, and there are plenty of opportunities for things to go wrong. That being said, an unfamiliar menu, and more guests than usual on a holiday, are predictable things for a restuarnt to prepare for. With this standard in mind, I can report a disappointing meal of Middle Eastern cuisine at Makan on Feb 14. There seemed to only be 2-3 servers when we arrived at dinner time, with the restaurant almost full. The host told me they were still missing some server were yet to return from the Chinese New Year holiday, which I believe and sympathize with, but still didn't excuse the poor and inattentive service. After being seated with a menu, the waitstaff disappered for 20 minutes. When one of them finally reappeared, he informed us that we shouldn't be ordering off the regular menu anyway; there was a special Valentine's day set meal. Ok fine, we'll go with that, and could we get some water please? Another 20 minutes go by, and there's no sign of apps or water. We hail a different server, ask him to check on the food and the water and he asks if we still need to order...disorganized much? When the appetizer platter finally arrives, it's a mixture of hot and cold apps. The baba ghanoush is nice. The hummus is excellent (a highlight of the meal). The falafel is pretty good. The potatoes, and mushrooms are both complete devoid of taste. The salad is totally forgettable. Overall...3/5 for the app sharing platter. The meat sharing platter arrives 2 minutes later (coordination still suffering). Everything on the platter is cold. Some of the things probably tasted quite nice when they were fresh. The lamb chops are the biggest disappointment...even if they were hot, they wouldn't have tasted very good, because there was seemingly no seasoning on the outside. 1/5 on the meat platter. The kabsa chicken arrives. It's really nice - actually seems like it was made to order. 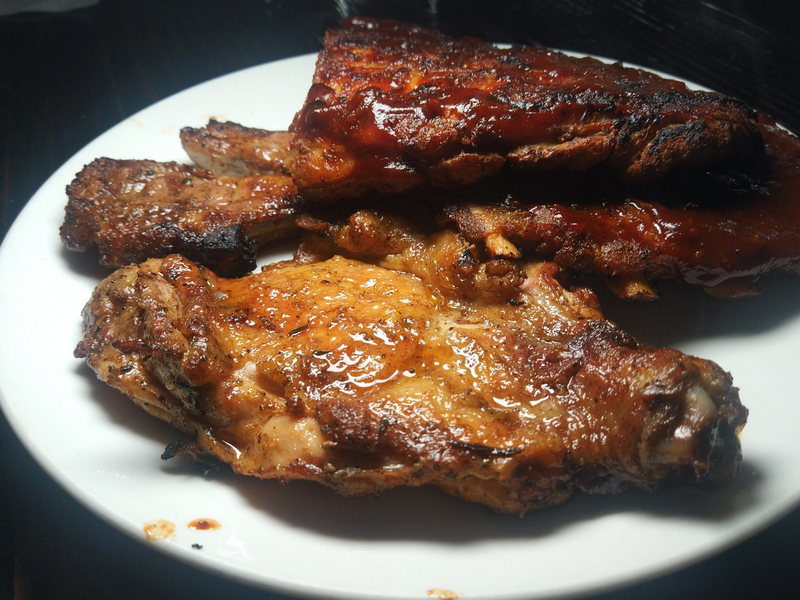 The seasoning on the outside of the chicken is flavorful and has marinated into the meat. The rice served with is is also warm and good. This dish gave me a glimpse of what this restaurant may be like if I didn't come on a holiday. We asked for water two more times throughout the meal, but it never arrived. We never got a glass of water to drink throughout our 90 minute meal. The dessert was tiny, and unremarkable. This is not the way to do a Valentine's Day special. 398 CNY, poorly spent. 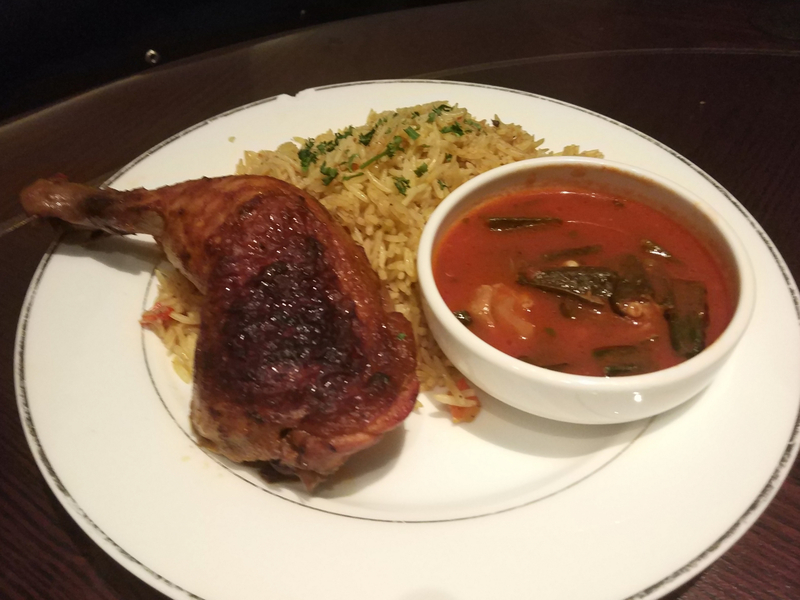 The whole experience was 1 star, honestly, but I cut them the tiniest of slack for missing some servers after CNY, and for the tasty kabsa chicken. 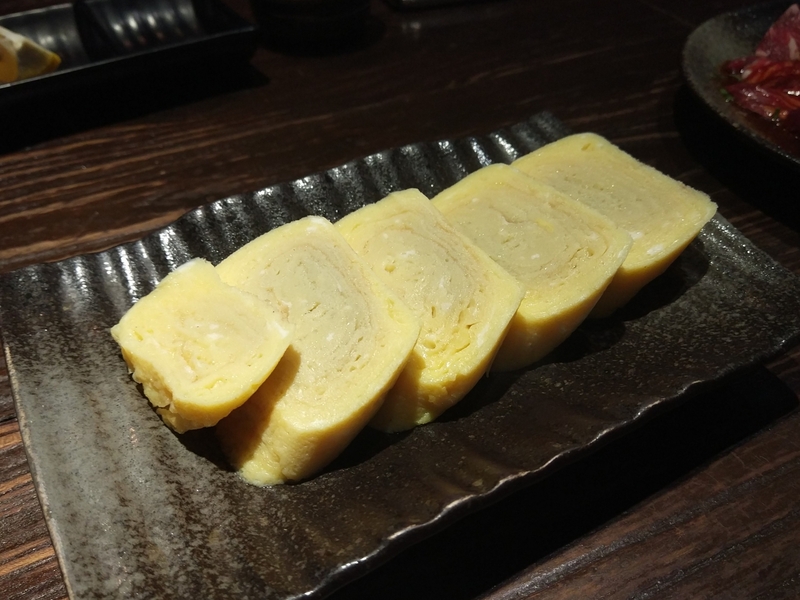 I'd be curious if anyone has had a better experience at Makan at another time. Does anyone dislike Xinjiang cuisine? 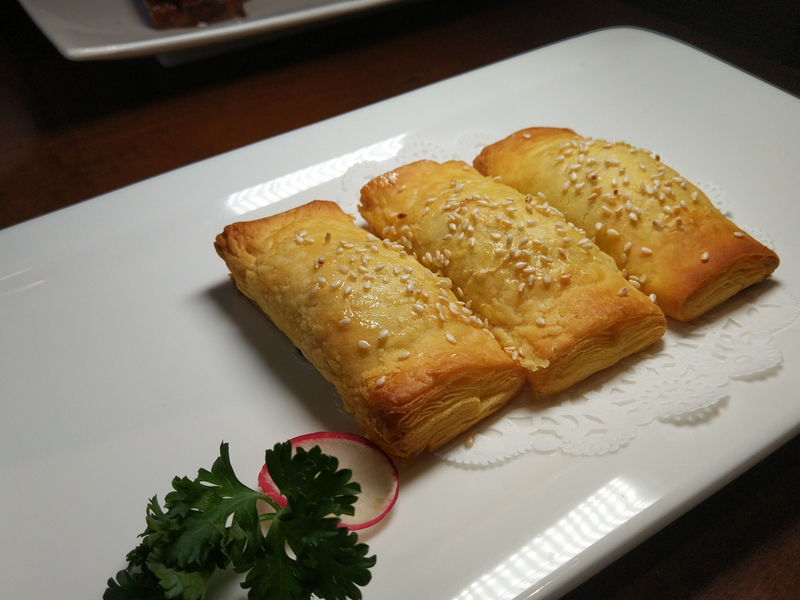 More than any other regional Chinese food, it seems to be Xinjiang food that is the most accessible to newly-arrived China expats. The spices and cooking styles used are often familiar to anyone who likes Mediterranean North African, or Middle Eastern cuisine, it's spicy but not too spicy, it's flavorful but rarely oily - truly a great way to ease into Chinese cuisine. The star of the show is usually the lamb. 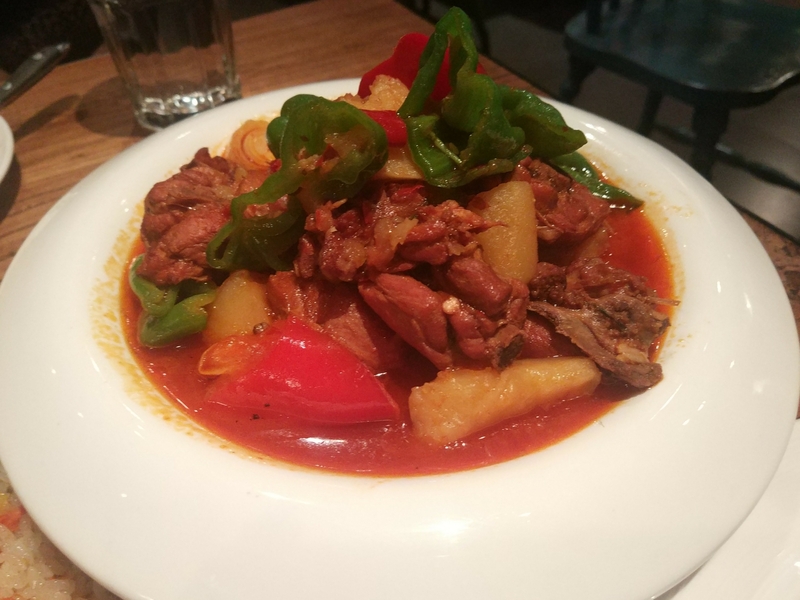 Western expats love eating lamb in China (for a combination of reasons I believe, not the least of which is that cumin and oil make everything taste good, but also certainly partially due to the relatively higher cost of mutton in many Western countries, meaning we don't get to enjoy it very often). 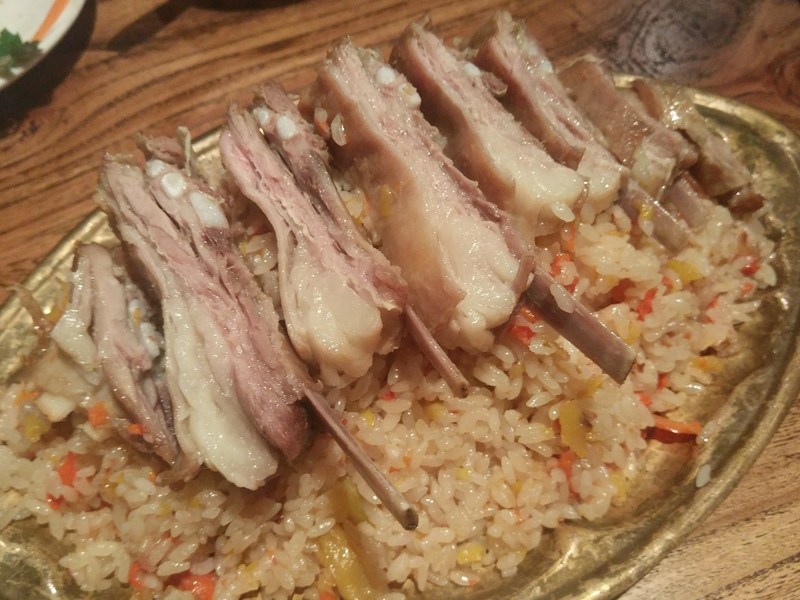 Whenever I find myself at a Xinjiang restaurant, you can be sure that lamb chops, lamb skewers, or a rack of lamb ribs are on my mind. Herein lies my disappointment with Miss Ali. Beef and potato braised in tomatoes: ehhh...3/5? Flavor was mostly of tomato, and the beef with a little tough. 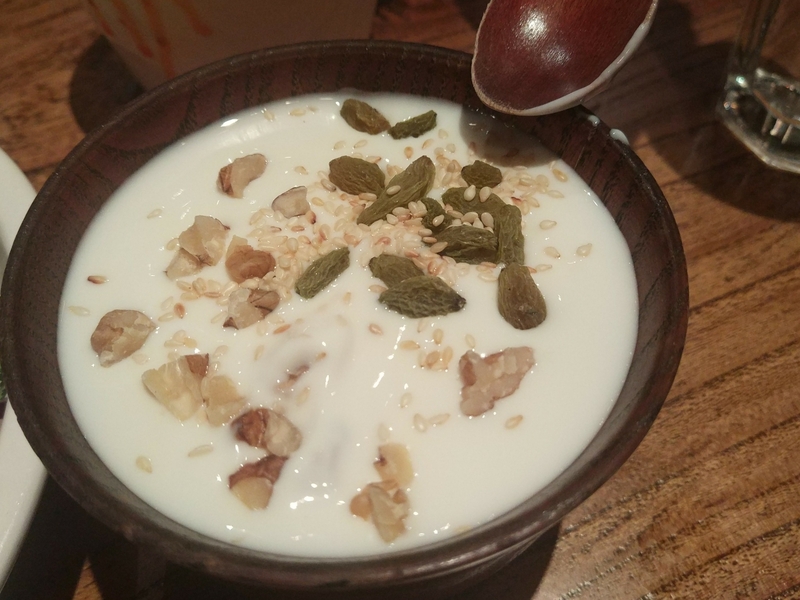 Xinjiang yogurt: I only got one bite of this, because my girlfriend just destroyed it by herself. I thought it was pretty good, but again, I only got one bite. I'll assume she'd give it a 5/5. Lamb chops over rice pilaf: 5/5 for the rice pilaf (because it was really delicious, although perhaps a bit too sweet for some) but 1/5 for the lamb, because it wasn't roasted! Look at the pictures! Look at those big chunks of lamb fat that haven't been toasted or melted down at all! Do you think those will be tasty?! I'm not sure how this lamb was cooked, but it almost seemed like it was steamed on top of the rice. If so, I do not approve, because steaming is not the way to release the wonderful fatty flavors of the meat! I've been to Miss Ali several times, and had wildly varying experiences each time, so it's tough to give it a final verdict. Their other roasted lamb dishes are good, and many of the things there are 5/5. My experience this time was disappointing, however, and I wouldn't recommend steamed lamb to anyone. Final score: 3/5, but I'll probably go back in the future and order other things. 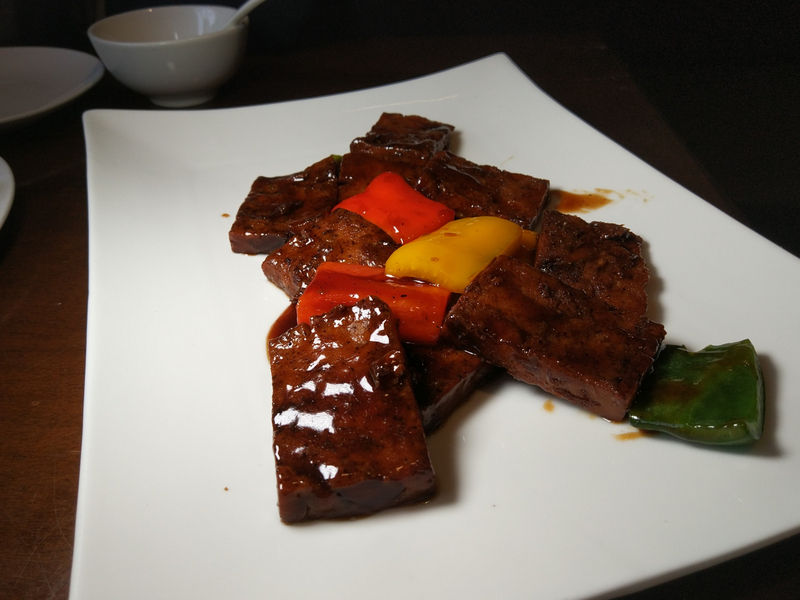 Shanghai is full of Thai restaurants, and it can be very difficult to find any that stand out in the sea of green curries, mango salads, and BBQ pork neck. It's not to say any of them are necessarily very bad, per se, (although they usually can't hold a candle to Thai cuisine in Thailand) it's just that they're all so...samey...little clone restaurants all serving the same basic dishes with the same flavors. 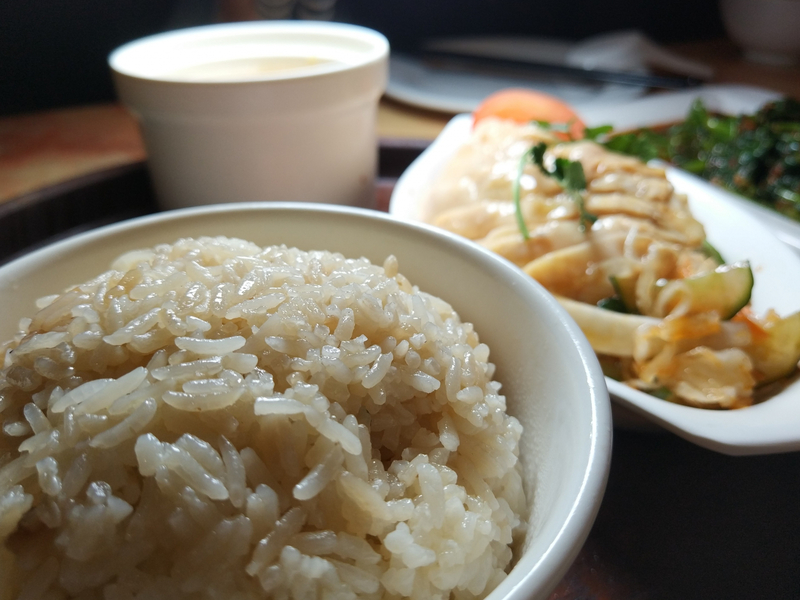 Thai Gallery, hidden in Jing'an Park, provides an opportunity to break out of that that mold, but you have to know what to order. We were a party of two on a weeknight evening, eating out for a special occasion (my dining companion's birthday). We arrived and were shown to a downstairs seat, which isn't quite as nice as the upstairs seating (that would have views of the small pond), but the upstairs seating was full and we didn't have a reservation. I imagine that on the weekend, a reservation would be advisable. Decor was warm and charming, without crossing the line into kitschy, which can sometimes happen with so-called authentically decorated restaurants. Immediately after the meal, we had tickets for a show, so we let the server know that speedy service and food preparation were key. Right away, the server gained some points for himself and the establishment, helpfully steering us away from dishes that he felt would take too long with our time limitations. We ended up selecting the specialty curry prawns, tom yum soup, fried crab salad, and stir-fried pork with holy basil. The food came out very quickly, with the longest dish (the prawns) only taking 15 minutes. 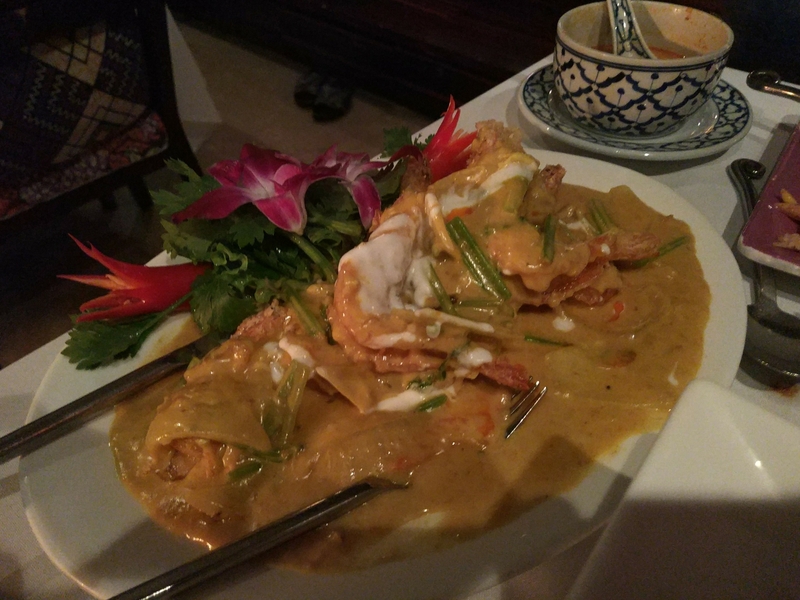 The prawns were undoubtedly the highlight of the meal, with the uinque sweet and savory flavors of the curry providing a nice break from the standard green/red/yellow curry options at Thai restaurants. 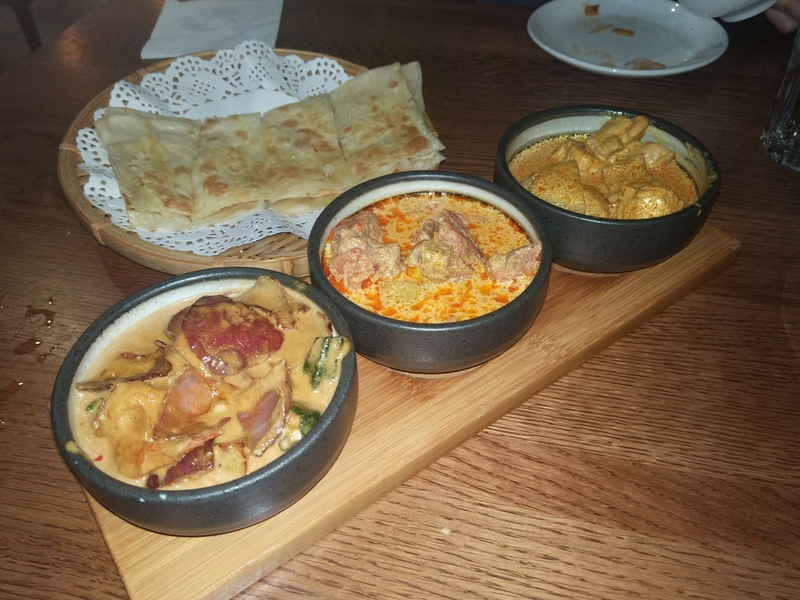 It seemed to be based on a massaman curry, but brought in many additional flavors that I wouldn't normally expect in massaman curry - very delicious and well worth the higher price tag (128 CNY). The prawns themselves were fat, juicy, and tasted fresh. The rest of the dishes were good enough - the tom yum and the stir fried pork with basil were perfectly acceptable, if not especially noteworthy. They scratched the itch. The fried crab salad we were not a fan of. The breading on the crab was very thick and quite oily - basically impossible to taste anything except fried batter. 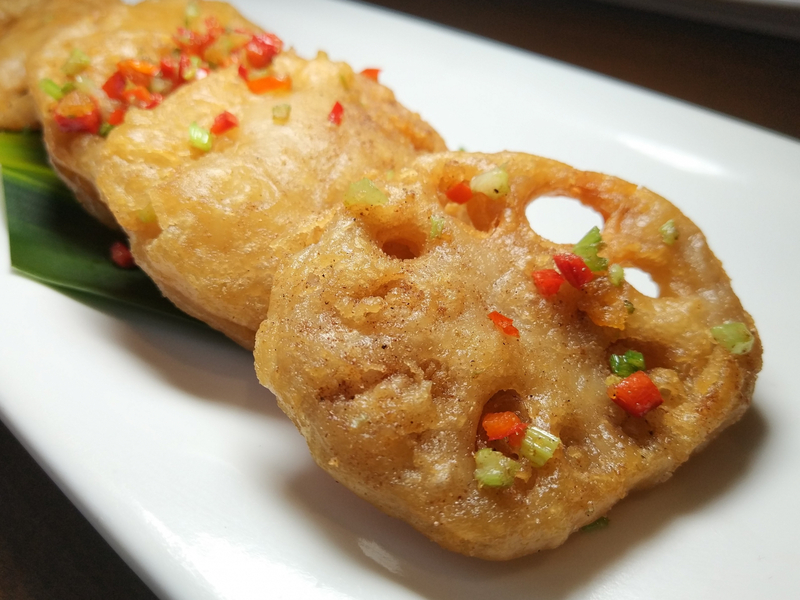 In general, I should know better about getting deep-fried things at Thai restaurants, since they are often very oily, and this confirmed my past experiences. Aside from that though, the rest of the meal was very good, and the excellent prawn curry really carried the meal. 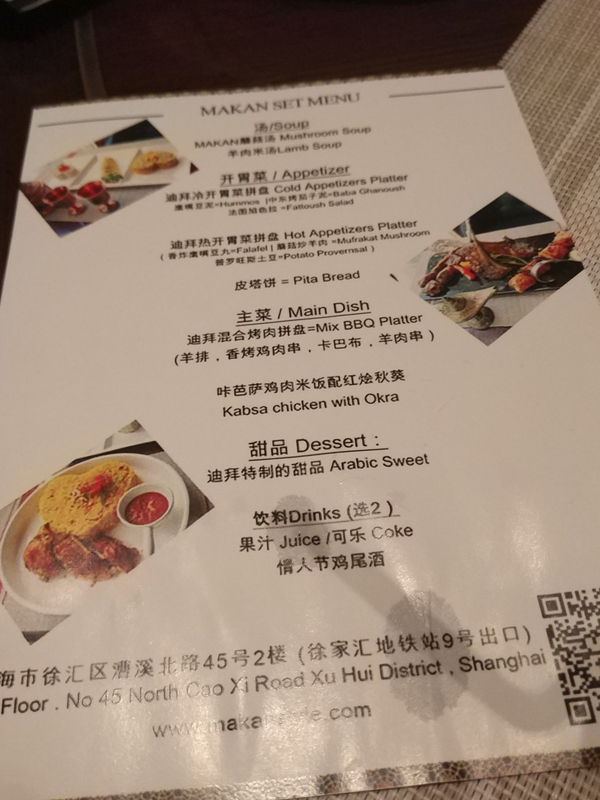 This is a good option for a smart casual meal (like a date), without pricing itself into silly ranges (our meal for 2 came out to just about 300 CNY). We were in and out in just about an hour, with time to spare for our show. 4 stars, which is about as good as it gets for Thai food in Shanghai. The Reel mall food court is one of those places that I absolutely never have felt the need to go eat at. It just didn't trip my food-loving instincts that I would find anything very compelling to eat there. Imagine my surprise when Dazhong Dianping directs me here for sushi on a Sunday afternoon. Now the fact that I'm searching for sushi on a Sunday afternoon definitely played a role in why I ended up here. It wasn't my first choice...heck it wasn't even my second or third choice. I ended up here because it was open at 3:45pm, and it seems 80% of the restaurants around me don't open for dinner until 5pm. That being said, I'm glad I ended up here. To keep things simple, we ordered the "Luxury Combo for Two" at A Sushi, which claims to be "European-style sushi". I was highly doubtful of this concept, and was gratified when absolutely nothing came out of the kitchen looking "European style". The set came with two miso soups, wasabi squid, seaweed salad, sashimi platter, 2 fois gras sushi, 2 caramel salmon sushi (I guess this is the European nod?) 2 roasted fluke with sea urchin, and the pièce de résistance: the “European Sushi Roll Combo” which came with 8 different rolls with various toppings. Two drinks were also included. This whole combo cost 258 CNY. To make it easy: almost everything was delicious. The fish so so fresh, no odor at all, not dried out at all (juicy and plump). 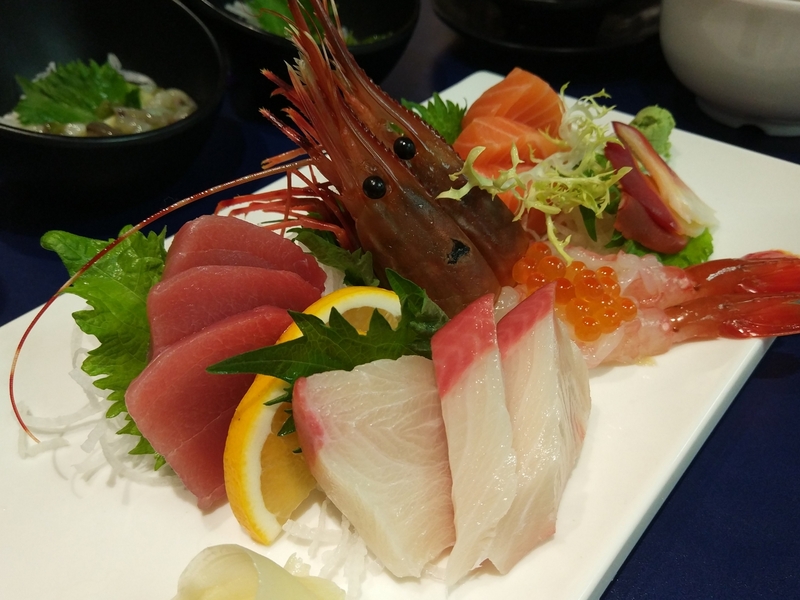 The sashimi was sliced wayyy too thickly to be proper Japanese style, but you won't hear any complaints from me! The platter included salmon, tuna, surf clams, amberjack, and two huge prawns. I don't care much for raw prawns, but everything else on that plate was amazing. 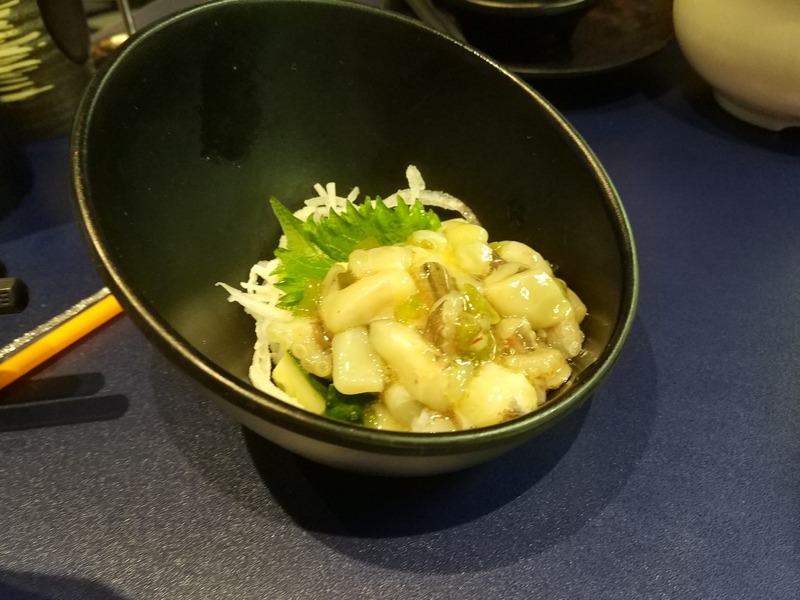 I especially want to call out the surf clams - these are often pulled out of a package at inexpensive sushi places in Shanghai, but these were full, juicy, and full of flavor. 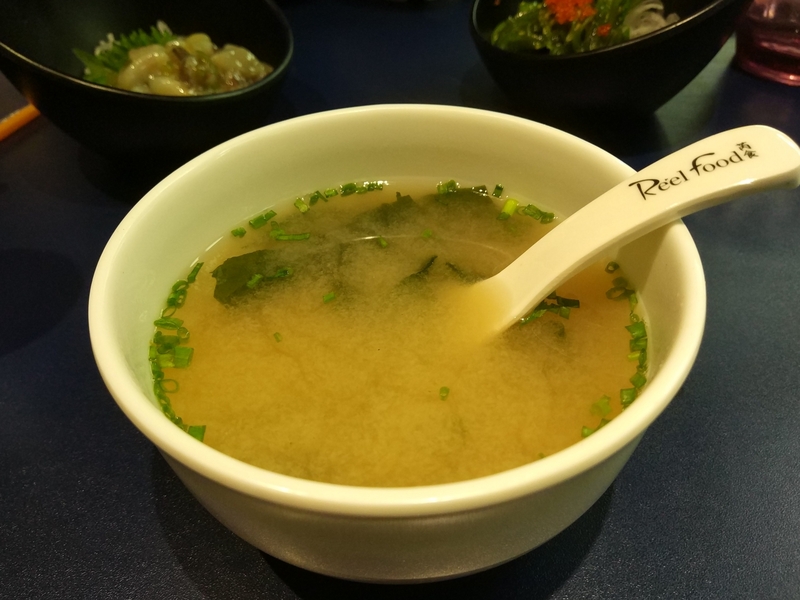 The side dishes and apps were all very satisfying and served their purpose very well, especially the miso soup which was satisfying without being too salty. 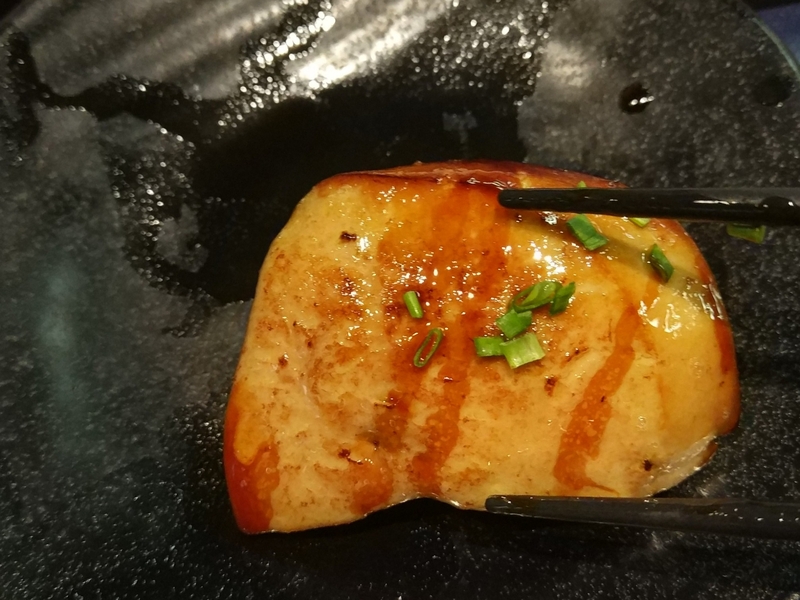 The fois gras was excellent, a generous piece of fatty, unctuous, warm goose liver that was grilled nicely and not too overpowering. The caramel salmon sushi was surprisingly good as well - a little sweet but not overly so. The rice portion was a little too large to be tradiditional on that one, however. The only disappointing item was the flagship dish: the European Sushi Roll Combo. The whole thing was a beautiful feast for the eyes, but that was sadly its most appealing charactering. 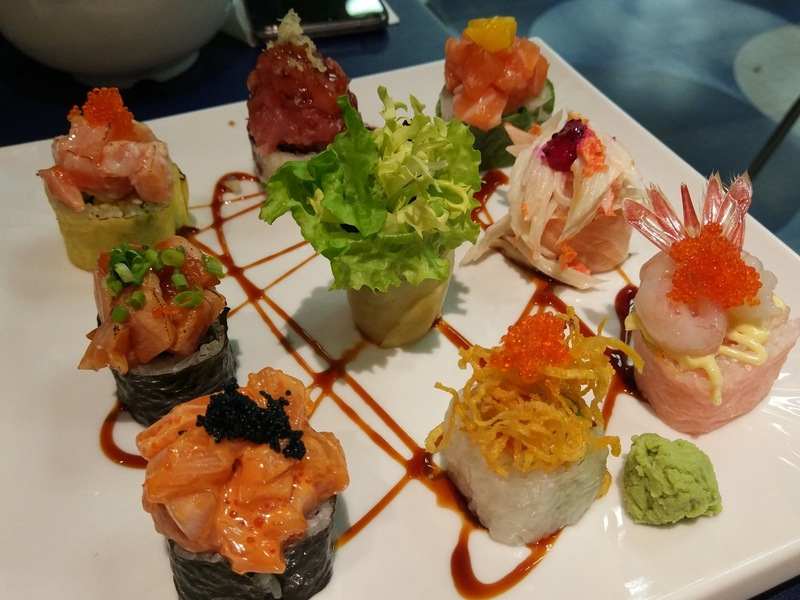 Although it's a great idea to serve 8 different beautiful rolls topped with marinated fish, caviar, beetroot, etc., serving 8 different items in one dish means it's impossible to make each roll to order. 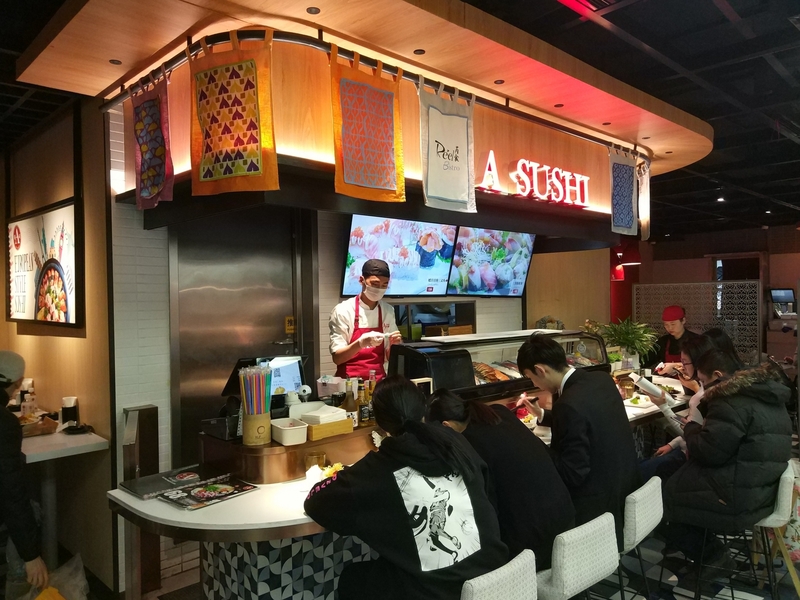 The menu noted that only 20 of this dish are available each day, which means the chef makes probably 10 of each of the 8 types of sushi in the dish in advance, cuts them into rolls, pre-portions them out, and adds the toppings when they are ordered. While they are waiting to be ordered, they are refrigerated, which is never a good idea for sushi rice, as it dries out very quickly. 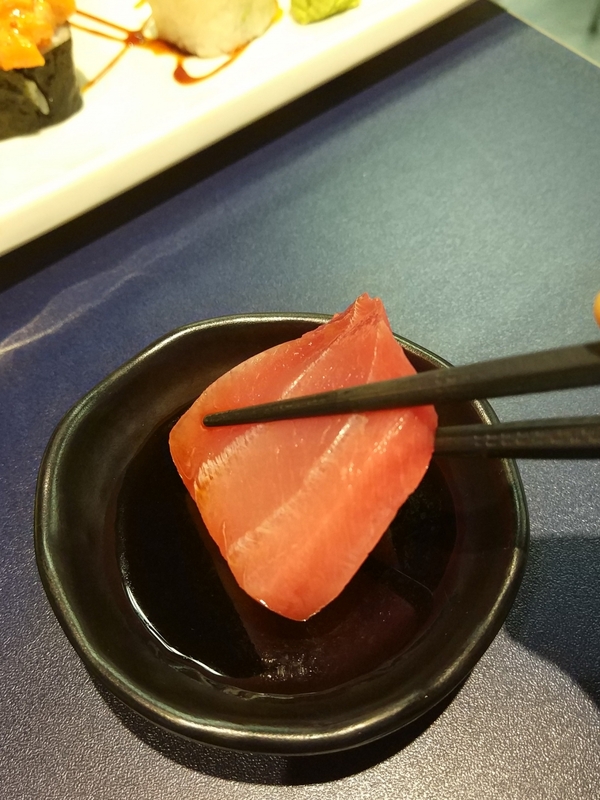 I am always sensitive to sushi rice served cold (instead of room temperature) as it indicates that it was not made to order, and that's what we got with this dish. It was undoubtedly beautiful, but the flavors were lacking and the rice was cold. 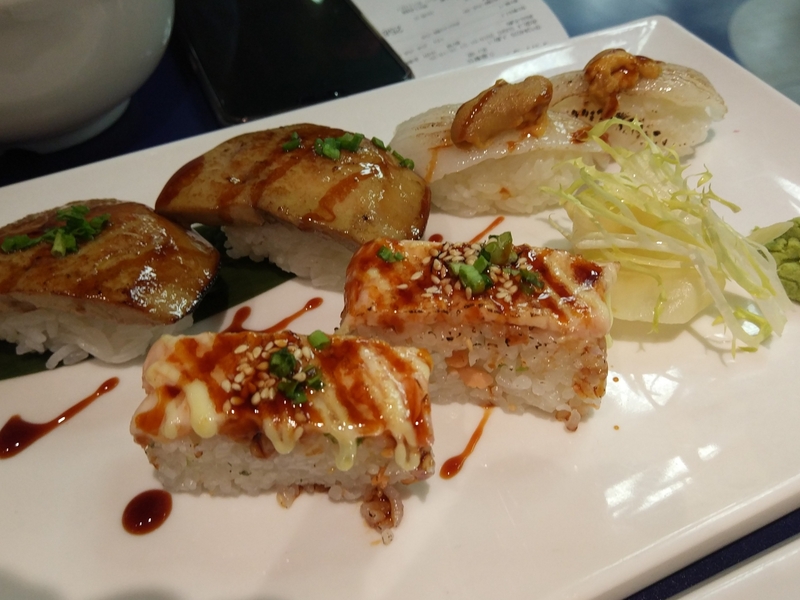 All in all, A Sushi is a great choice for inexpensive sushi in a very expensive neighborhood. The food court in Reel gets super packed around meal times, so be prepared to wait if you're arriving during the lunch or dinner rush. Just go with the fresh, made-to-order options and avoid the eye-catching but unfortunately pre-made and refrigerated Euro Combo and you'll do just fine. 4 stars out of 5. Japanese BBQ, but does it know it's Japanese? 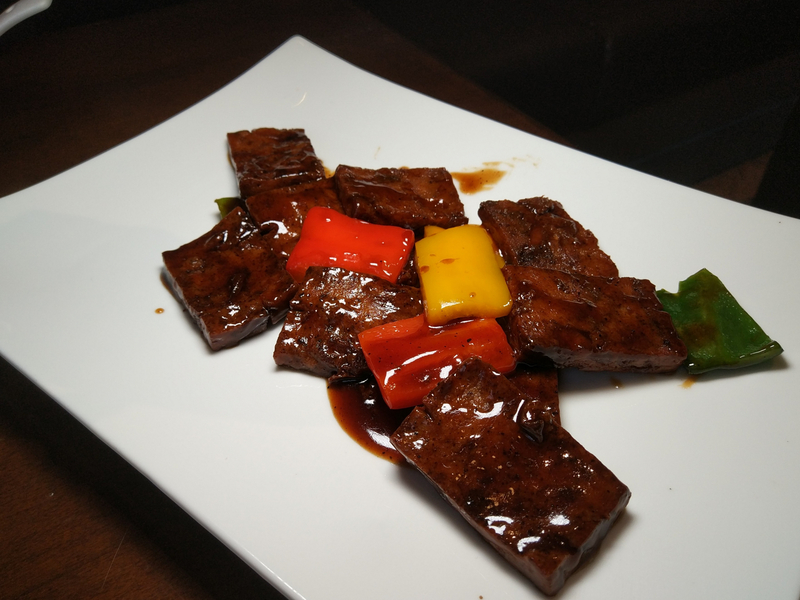 Niku29 is well located in the F&B hub of the Jiaozhou Lu/Wuding Lu/Yanping Lu area. The prices are attractive. The warm decor is perfect for a cold winter day. The food is...Japanese...ish? Frankly, I couldn't distinguish what made this Japanese-style BBQ vs. Korean-style BBQ. We ordered the beef platter and the speciality pork as well as a fresh green salad, udon noodle soup, and Japanese omelet roll. The food all came out in good time, although the fact that we were eating at an odd hour on the weekend (4pm) and the restaurant was empty may have had something to do with that. Everything was just...fine. The flavors weren't jumping off the plate or antyhing like that, nor were they unappealing. They just...were. The speciality pork is roasted for you on a side table with some onions, and it was BBQed well, but it wasn't marinated in anything special. The dipping sauce that came with it was one of those savory marinated bean sauces that tasted like it came straight out of a package...nothing unique to it. 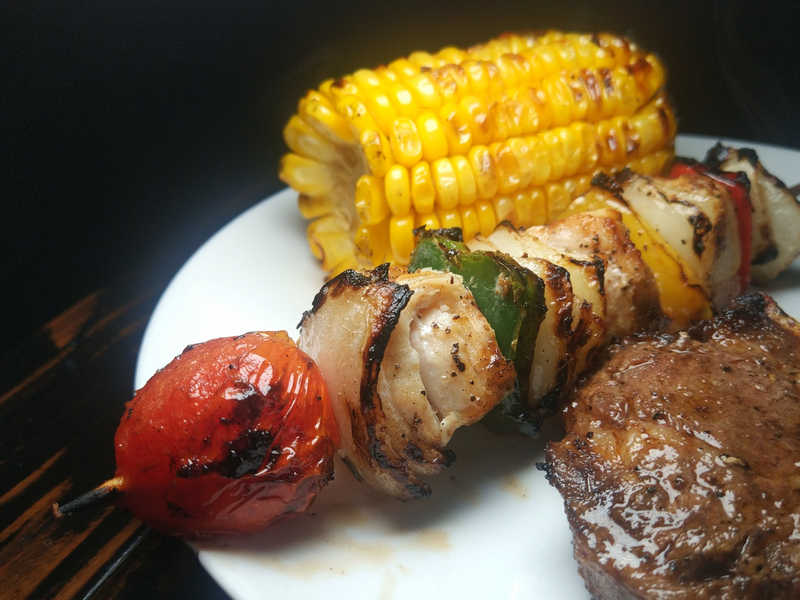 None of the beef was especially notable in flavor either - the dipping sauces were limited to just 2 options and nothing was marinated, so overall it was just totally unremarkable in flavor. 'Unremarkable' is how to describe the omelet roll and salad as well - nothing bad to them, but nothing worth going back for either. 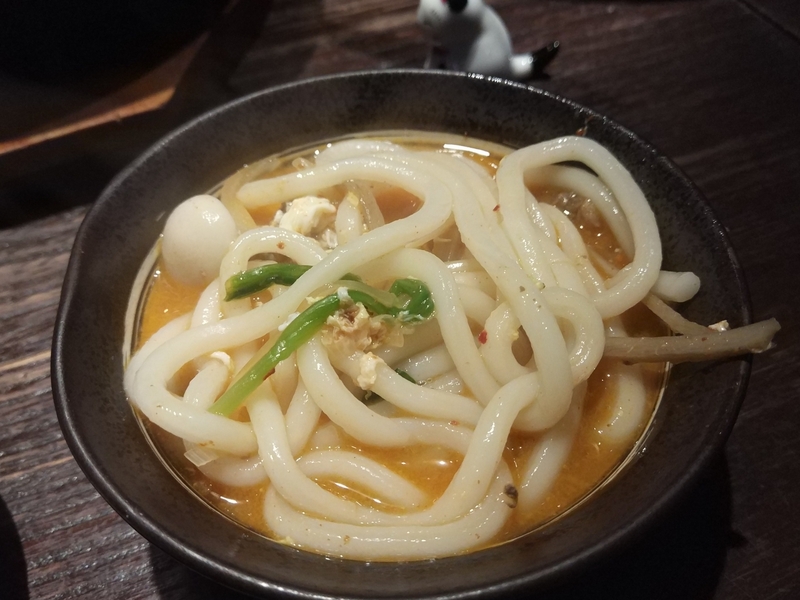 The udon nooodle soup was the only bright spot of the meal for me: hearty, spicy, savory, a perfect dish for a cold day. I would go back for these noodles, but not much for anything else. 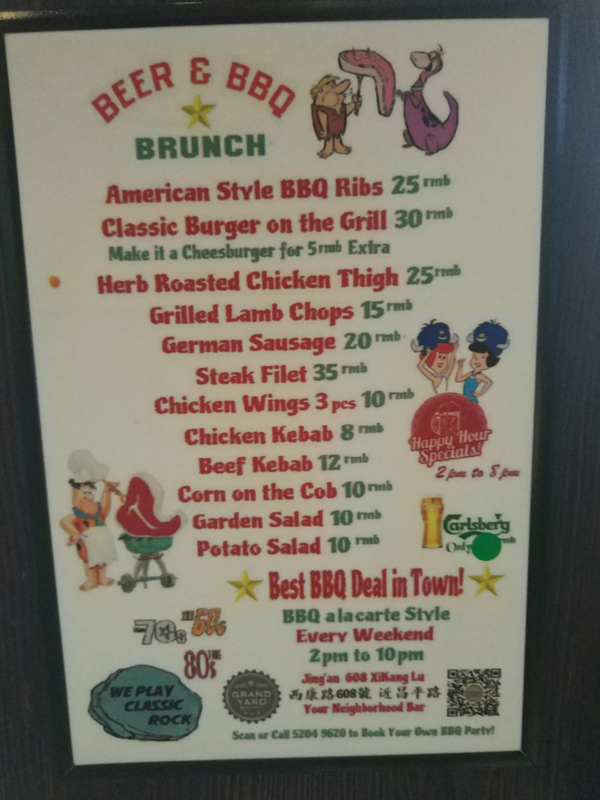 Checking online, it's the only option for BBQ in the neighborhood with such a reasonable price range, but the total lack of specialty flavors of marinades on the meat made it hard for me to distinguish this as Japanese BBQ vs. Korean BBQ vs. anything else. Perhaps I ordered incorrectly...and it's hard to get too upset when the final bill comes out to less than 250 CNY for two people, but I would like something with a little more pizazz. Final score is more like a 3.5/5, because there's nothing really BAD about the place, but I don't have that option here. The decor is nice and cozy and it could be nice for an inexpensive roasted meat option on a cold day. Kao Jiu Noodle Shop is the kind of local resturant in Shanghai that absolutely deserves more attention, but a combination of sub-optimal location and no attention from foreign food aggregation apps means it will fly under the radar for its whole life. Fortunately for you, I am here to fix that for you. 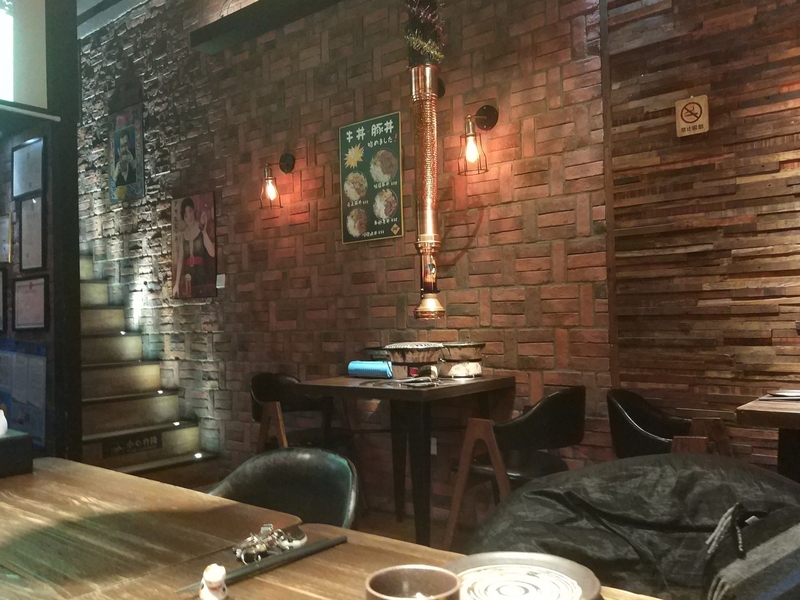 Kao Jiu is located wayy up Wanhangdu Road, in the part of Jing'an that you seems to consist entirely of office buildings and residential complexes, just south of Changshou Road. The shop is small and unfancy, with a menu that seems much too large for its 5 seats (as Chinese noodle shops usually do). I've been here several times and tried a few different things each time, generally enjoying everything I've had. 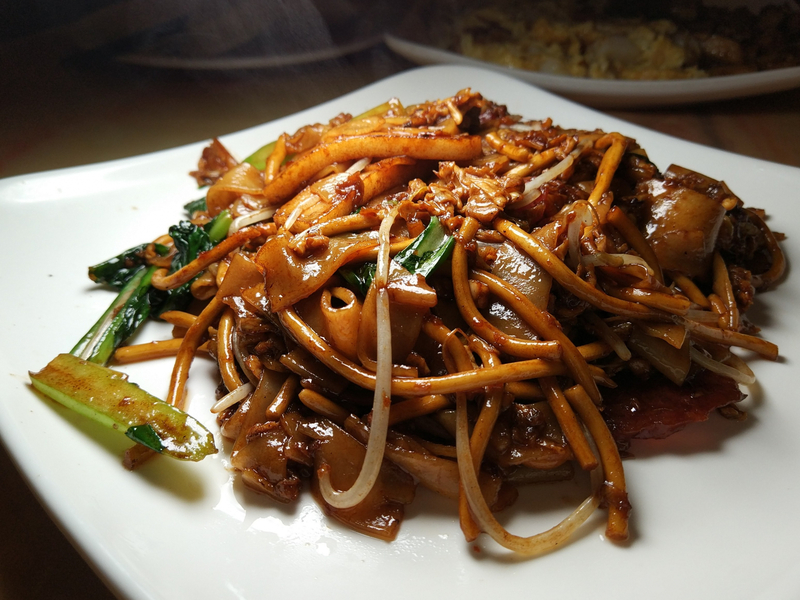 The standout is the scallion oil noodles - freshly made, fragant, and topped with chewy fried scallion greens as well. This incredibly simple dish is just so excellent when it's done right, and Kao Jiu knows how to do it right. 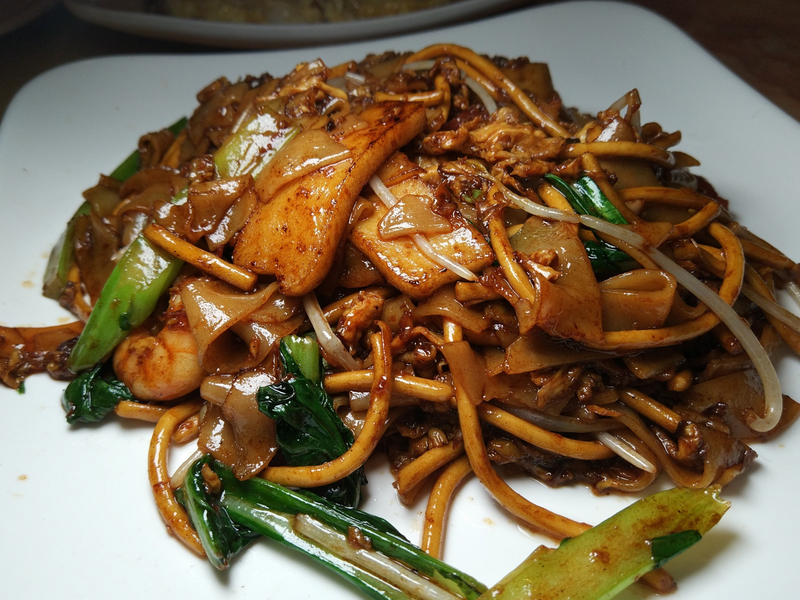 Aside from the scallion oil noodles, the la rou noodles are also great. 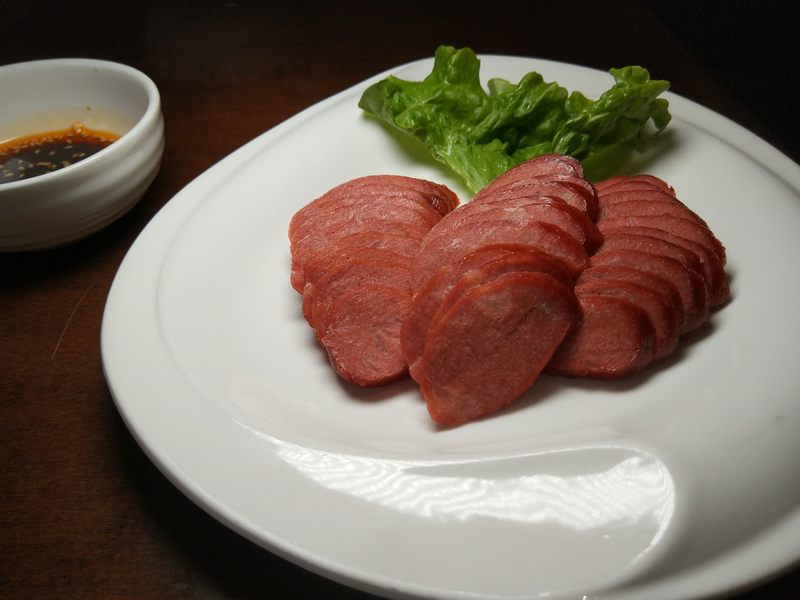 La rou (辣肉）is a kind of Shanghai-style marinated spicy/sweet pork preparation that's usually tossed onto a bowl of fresh ramen for quick and easy noodle soup seasoning. 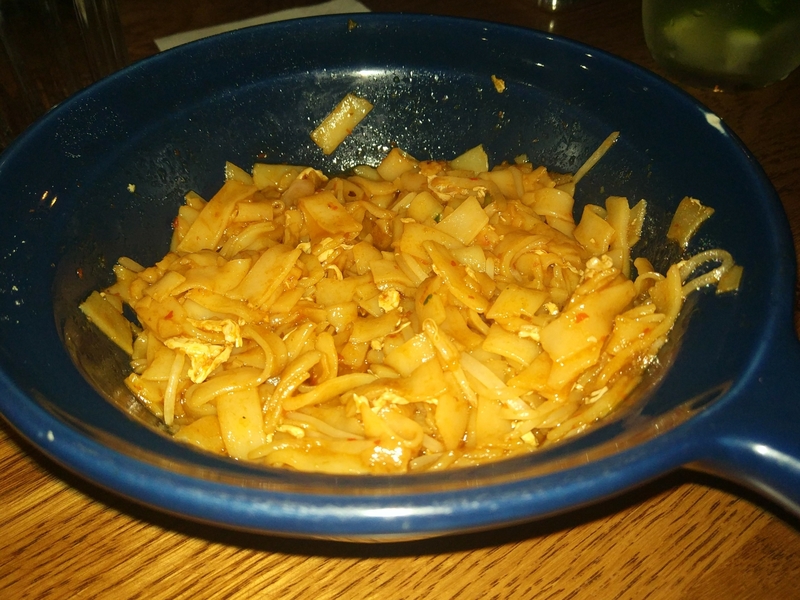 They go a great job with their la rou at Kao Jiu, and I can also highly recommend. 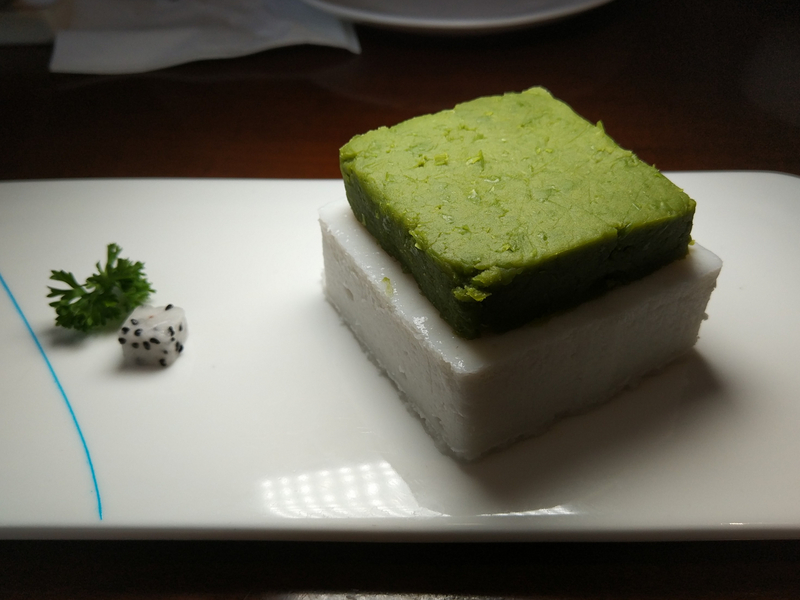 On a recent trip, I also ordered a side of kao fu (烤麸), i.e. 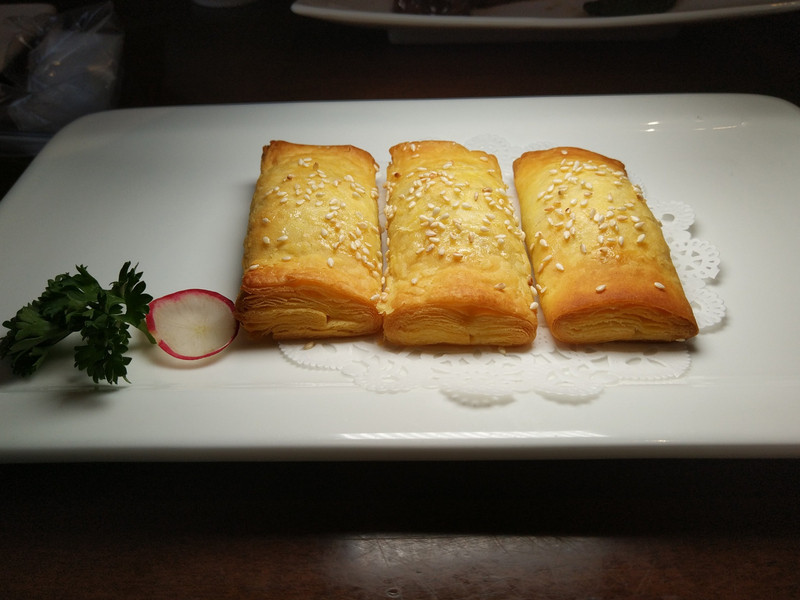 the brown spongy soy product that usually is served in Shanghai restaurants as a sweet appetizer. The kao fu at Kao Jiu was not as sweet as Shanghai restaurants usually serve it, which I appreciate, since the sugar sauce can sometimes be a little overwhelming. Overally, Kao Jiu is a clean little Shanghai noddle shop that excels at being itself. It's always busy when I've been on both weekends and weekdays, and I imagine it's very popular with the lunch crowd in the neighborhood. Give it a try if you're swinging through and find yourself a bit peckish, and you'll leave with a full stomach and only about 30 CNY of damage to your wallet. I'll keep this review short and to the point, since I'm only reviewing the bagels here, and I didn't try any savory breakfast sandwiches. I'm not reviewing the guy who sat next to me eating his bagel with a knife and fork (! ), but I'd give him 1 star if I could. Or zero stars. Eating a bagel with a fork deserves no stars. 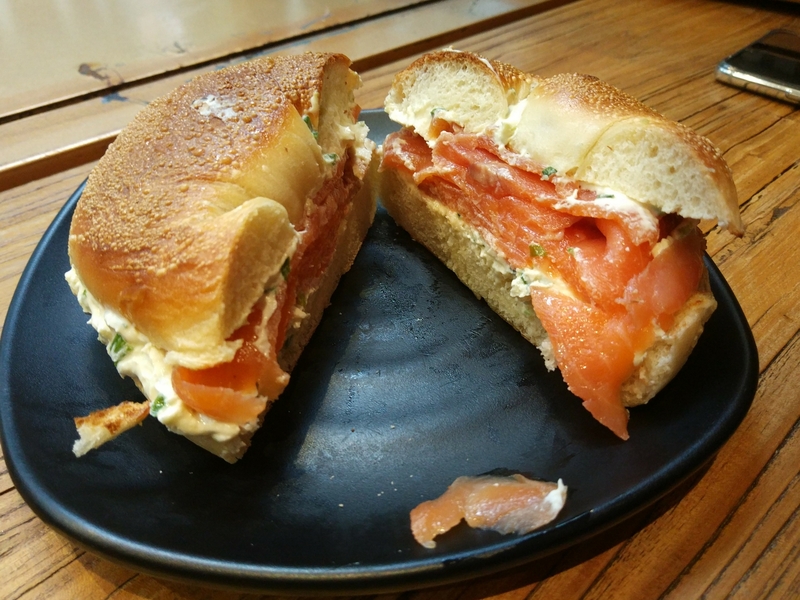 Plain bagel w/ scallion cream cheese and smoked salmon - just...ok The portion of cream cheese portion was laughably small, which is consistently a problem of bagels in Shanghai (among the few bagel places we have). The thick serving of smoked salmon was appreciated, but it made it more like a smoked salmon sandwich with a bit of cheese. Not bad value for money, but poor ratio of salmon to cheese. Plain bagel itself was alright - I would have liked it a bit chewier. 7/10. Cinnamon bagel with walnut cream cheese - was not good. The bagel tasted old - wasn't chewy at all, just kind of dry and pulpy in my mouth. Maybe the dough was overworked? 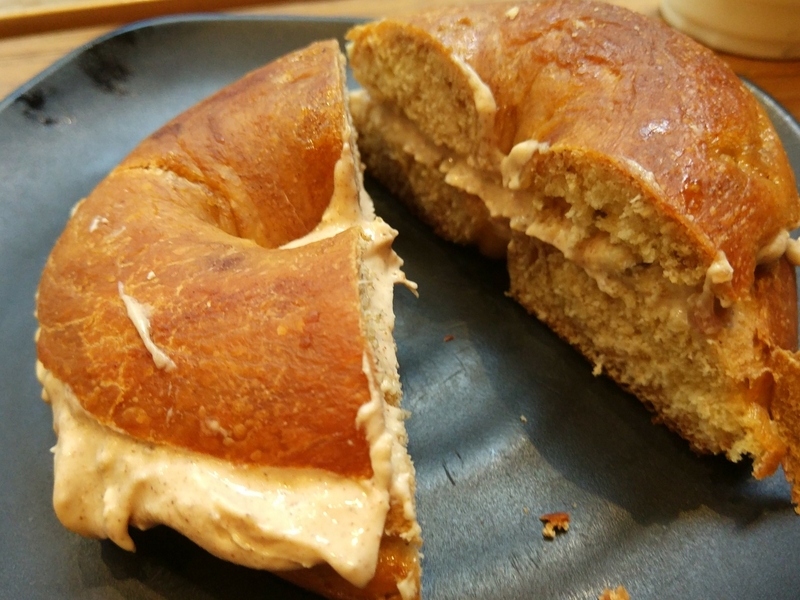 The serving of cream cheese was also very skimpy, but it didn't have any other fillings to balance things out, so it was mostly a mouthful of dry, pulpy bagel. Not a pleasant experience. 3/10. The final verdict: it's ok if you're craving a bagel in this part of town, but prices are high-ish and the bagels appear to be hit or miss. Considering Spread the Bagel seems to have found a new temporary home inside of Al's Diner on Xiangyang, that would be a far better choice for a bagel fix, as long as you don't mind making a trip over to that part of town. 3 stars of 5. Went to Fat Cow for a weekend dinner with a few other SmartReviewers. It was a last minute impulse decision since our original dinner destination was already fully booked, (silly us...no reservations) but fortunately Fat Cow was close and had been on my wish-list for a while. I've tried to come here multiple times for the Monday BOGO deal, but always been deterred by the gross wait for a seat, so finally had to cave and come on a weekend. The guys grabbed cocktails while the ladies grabbed beers, subverting the expectations of the poor waitress who steadfastedly tried to hand the beers to the guys. Our wait to be seated was speedy, so we only had a few minutes to admire the eclectic interior design (especially the clock...check out the clock over the bar if you go). The menu was an absolute atrocity of cow-related puns that I refuse to repeat here, but if you like that kind of thing, you can go experience it for yourself. I ordered a cheeseburger with bacon and fries - as classic as you can get. Although I tried to order my burger mid-rare, the server told me the kitchen will only go as rare as medium. This is strangely common in China - in the US you pretty much only see this at chain restaurants worried about health lawsuits. The char on the burger itself was pretty good when it come – the patty was juicy and pink on the inside with nice dark grill lines on the outside. Unfortunately it was under-seasoned – no trace of salt or pepper at all on the burger crust. I generally like my burger meat free of breadcrumbs and egg yolk and all that other silly stuff, but I do need some seasoning on the meat! The bacon could have saved the day, but it actually wasn’t very salty itself, nor crispy the way I like my bacon. It wasn’t outright terrible like those sad strips of non-cured grilled pork masquerading as bacon that you get on your burger in Chinese McDonald’s, but it wasn’t living up to the full potential of bacon either. The side of pickle and the extra mustard I asked for ended up providing most of the flavor to complement the beef. All in all, it was a perfectly acceptable burger that doesnt' quite distinguish itself from the pack of other perfectly acceptable burger places we have to choose from in Shanghai. I would go back to Fat Cow to try some of their other more exotic burgers, but I wouldn’t wait for two hours for Monday BOGO and I think there are better places in town for a classic bacon cheeseburger. I’d give it 3.5 stars overall if I could, but that’s not an option, so I’ll round it up to 4 on the basis of the nice dessert (the red velvet cake and the ice cream parfait were both solid) and the great cocktail prices for happy hour (30 CNY!). Unfortunately have to report a very strange experience at Mandi Mandi this past weekend. 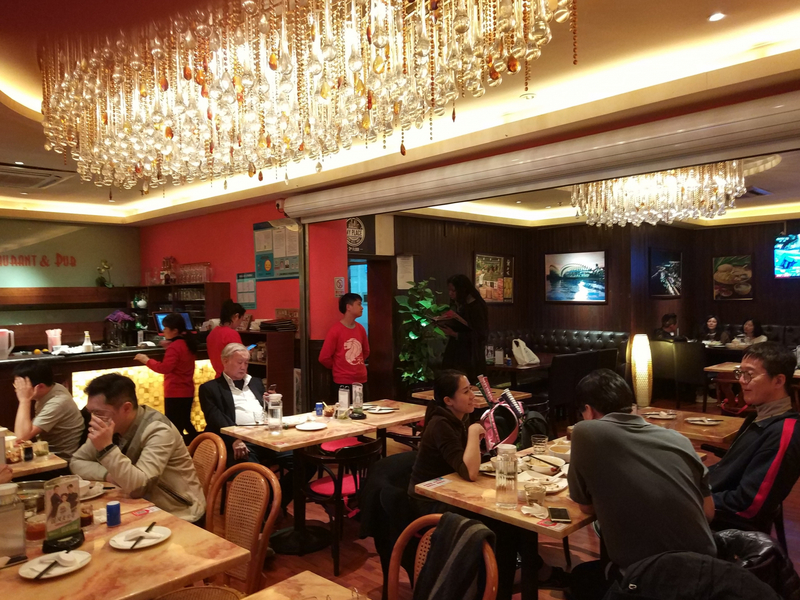 This is a restaurant that I've eaten at in the past and I had a good impression of it as a good option for inexpensive and authentic Italian food in this part of the city (Fumin Lu and Julu Lu). This time around, however, we were sadly let down. There were a lot of tables taken up by people having just one beer, or a sparkling water while they work on their laptops (kind of annoying), but fortunately we were able to take the last available seats. We ordered a mozzarela salad (caprese salad), ham & mushroom panini, and a pesto pasta along with two waters. The wait was longer than would be expected for the mozzarela salad, close to 30 minutes for a dish that requires no cooking. The restaurant was quite busy with people ordering coffees, cocktails, and ice cream, but that shouldn't have been affecting the kitchen staff. The hot dishes arrived just a few minutes after the salad, so it seems the work flow in the kitchen was having some issues. The mozzarela salad looked nothing like the picture on the menu, or anything like any caprese salad I've ever seen before. Instead of slices of fresh but firm mozzarela cheese mixed with tomato and sprinkled with herbs, as I would have expected, the fresh mozzarela was served in one big blob in the middle of the plate on a bed of arugula with five slices of tomato fanned out around it like a pinwheel. The mozzarela was very fresh, and only the outside shell had barely set; the inside was like a cheesy soupy mess. The flavor of the cheese was quite good, but it was difficult to eat and enjoy given the bizzare presentation. The waitress said that the Italian owner of the restaurant had recently switched to this type of cheese because it's of higher quality, which may be true, but doesn't make any sense at all for this dish, which customarily features slices of semi-firm cheese. I also didn't understand why we only got half a tomato - were they saving the rest of the tomato for another customer?? The tomato didn't have very fresh flavor at all, which was also disappointing consider it's basically 50% of a dish that you pay 70 RMB for. I would recommend using higher quality tomatoes for a dish in which they feature so prominently - vipe-ripened at least. The arugula was fine, if a bit out of place (wouldn't this dish usually be served with basil?) Overall, good cheese flavor, but untasty, skimpy serving of tomato and bizzare presentation - poor attention to the details of the dish. 3/10. The pesto pasta was bland, bland, bland, and the spaghetti was overcooked. Not just a little overcooked...VERY overcooked, almost mushy. The basil flavor was very light and there was no other flavor in the dish, not even salt. This is what you'd expect from Saizeriya for 22 RMB, not an Italian-owned restaurant in Shanghai for 75 CNY. Overall 1/10. The ham panini was passable, but prevented from being very good, again because of a lack of attention to detail. The flavor of the ham, mushroom, and cheese itself was quite nice (a bit salty, but obviously that's what you get with cured ham) and the smooth creaminess of the aioli sauce it came with kind of made up for the saltiness. What held this sandwich back was the usage of the wrong kind of bread. Just crushing something in a panini press doesn't make it a panini; ideally it should be using some high-quality Italian bread style like ciabatta, which will crush down to a reasonable thickness and develop a nice crusty exterior while maintaining a soft pillowy interior. The bread used for this sandwich was a very mealy Chinese version of a French baguette that was very hard on the outside, dense on the inside, and totally tasteless from a bread perspective. After being crushed in the panini press, the outside of the bread was so hard that it was unchewable, like day-old bread. Big disappointment for a sandwich that actually had nice-tasting fillings. Overall, 4/10. I don't know if I caught Mandi Mandi on an off day, or if standards have really slipped since the last time I went there. It's got really positive reviews on Bon App (86%), so I wonder if I got unlucky with the regular chef on vacation or something. 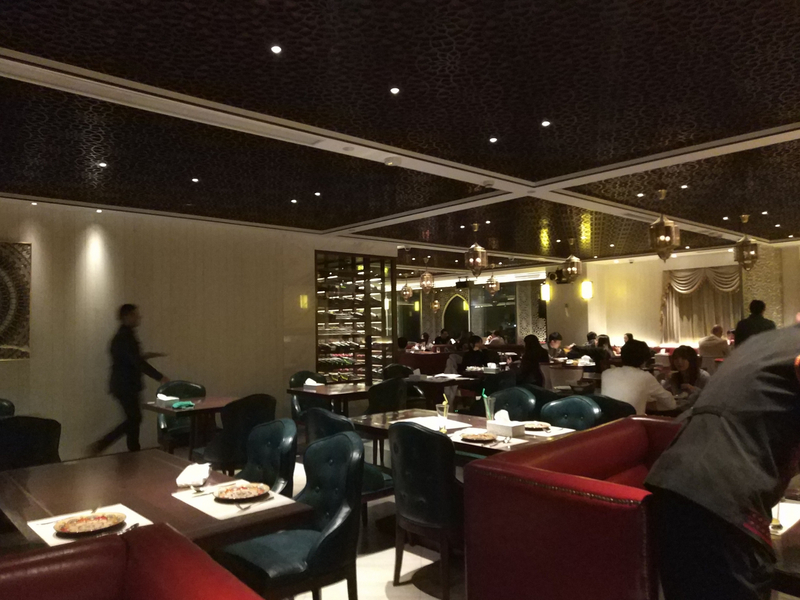 Then again, the top review on Bon App for this restaurant (a positive one) features the identical studio-grade photographs that are used on the restaurant's menu, so I don't know how reliable the Bon App reviews are. Final score, 2/5, because the panini was sort of OK and the waitstaff were nice enough, and because I remember that it was good the first time I went. Maybe I'll give it another try in 6 months. 1. You're super into photography and are going to that pretty famous photography gear market on Luban Rd. & Xietu Rd. Whatever the sad reason you find yourself chilling out in this part of the city, fear not, because I've got your food situation sorted. Yue Lai Ji is on Dapu Rd, a little north of the intersection with Quxi Rd. The sidewalk is cluttered with scooters and there's ayis in their pajamas fanning themselves on the sidewalk and the neighboring buildings are a wet market, a bubble tea shop, a bicycle repair shop, and one of those bedding supplies stops (does anyone under the age of 50 buy things there?) This feels like suburban Baoshan or something, but it's actually just 10 minutes from Tianzifang. The restaurant has a little downstairs window where they sell Canto-style braised meats and a few tables on the first floor, but the majority of the seating is on the second floor. Go upstairs and get ready to stuff yourself. Cantonese roast meat platter - Ordered the duck and cha shao, both came out excellent. Duck was juicy, savory, not too greasy. Cha shao had just the right amount of sweetness, meat wasn't too fatty, outside slightly crispy. They also have goose for +10 yuan but I didn't get it this time. Overall 9/10. Shrimp dumplings (xia jiao; har gow) - Did the trick. Not necessarily the best shrimp dumplings I've ever had but definitely more than serviceable. The shrimp were a bit chewy, so perhaps a bit over-steamed. Flavor in the dumpling was nicely savory and a bit sweet. Overall, 7/10. Shrimp + pork dumplings w/ roe (shao mai; sio mai) - Like the shrimp dumplings these were totally serviceable without being mind-blowing. Tasty, fragrant, savory, juicy. The shrimp was still a bit too chewy...either over-steaming or maybe they're cooking from not-quite-defrosted shrimp? Anyway, these get a perfectly passable 7/10. Egg custard buns (liu sha bao) - Ahhh, bliss. These are just about as good as I can imagine liu sha bao can get. I think they compare very favorably to the best dim sum I've had in Hong Kong, and they are thankfully free of the frills that often accompany this dish (i.e. piggy ears, black dough, ornate designs). Just liquidy gold custard, sweet and salty and still runny after sitting for 10 minutes. Definitely a highlight for me. 9/10. Meatball soup - A surprise winner for me, as I had never tried this dish before. The meatballs were chewy, meaty, beefy, really tasty. It reminded me of the beef meatball with vermicelli that I recently reviewed and enjoyed at Bali Bistro. The beef is ground and then reformed into meatballs with some kind of binding agent that makes them chewier and springier. A very generous portion too, for the price. I'm a fan. 9/10. Stir-fried egg & prawns - I over-ordered, as I often do at Canto/dim sum restaurants, and so by the time this last dish arrived, I was already really stuffed and unable to truly enjoy it the way I would on an empty stomach. Taste was very good though, and the egg was cooked perfected for this dish (all yellow, no browning, still a tiny bit watery looking, glistening in the light). The prawns used in this dish were different from the ones in the dumplings - bigger, juicier, and not overcooked, so more enjoyable. This is definitely worth ordering. 8/10. Bean juice sparerib clay pot rice (bao zai fan; bo zai fan) - Why did I even order this? I'm not even hungry anymore...oh right...because it's actually the specialty here. And man is it gooood. Let the server mix it up for you, and then let it sit for a while so you can form a delicious crispy-sweet-savory crust on the bottom of the rice where it touches the hot clay pot. 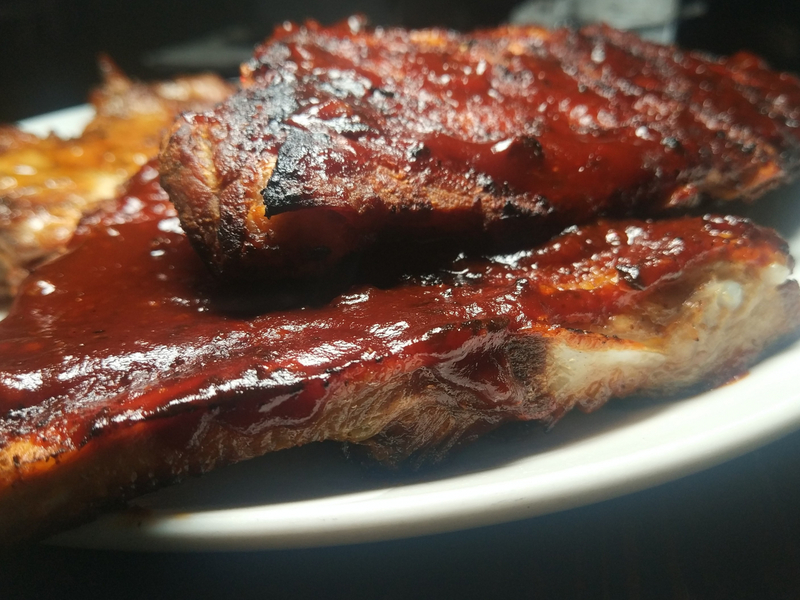 The spareribs are juicy, savory and totally umami-pleasing with that bean juice broth. The rice is crispy and oily and shiny. The bok choy is...bok choy. Overall, this is a great dish, worthy of its specialty status. 9/10. Service is friendly, but frazzled, since it's a very popular restaurant with the Chinese (4000+ reviews on Da Zhong Dian Ping). You'll probably have to call them several times to get the check or to get more tea water. During meal times, you'll probably have to wait for a seat. The restaurant was about 75% full when I went at 3pm. Price is amazingly high value. We ordered that absurd volume of food above for 2 people and it came out to 191 CNY. The most expensive item was the roast meat platter, for 52 CNY. Final score: 5/5. When I need a dim sum fix, I'm willing to make a trip over here just for this restaurant. It's a shame there's nothing else to do around here. Shanghai's Korea Town is way out there in Gubei, within spitting distance to Hongqiao Airport. It's not on most our daily commutes. But, if it's the National Holiday, you've got time to kill, the weather's nice, and you've got a full charge on your electric scooter...well hey, let's go to Shanghai K-town! Shanghai K-town is an oddity to be sure. It's basically just a block of two little streets with a bunch of Korean banks, restaurants, and one shopping mall. There are a few Korean coffee shops and 2-3 grocery stores and the whole thing feels like a single street was plucked up from Seoul and plopped down in the Western Shanghai suburbs. Wikipedia tells me there are 40,000 Koreans living here. You're spoiled for choice when it comes to grabbing some good Korean BBQ when you're out here, and that's what I mostly had in mind when I made the trek out. 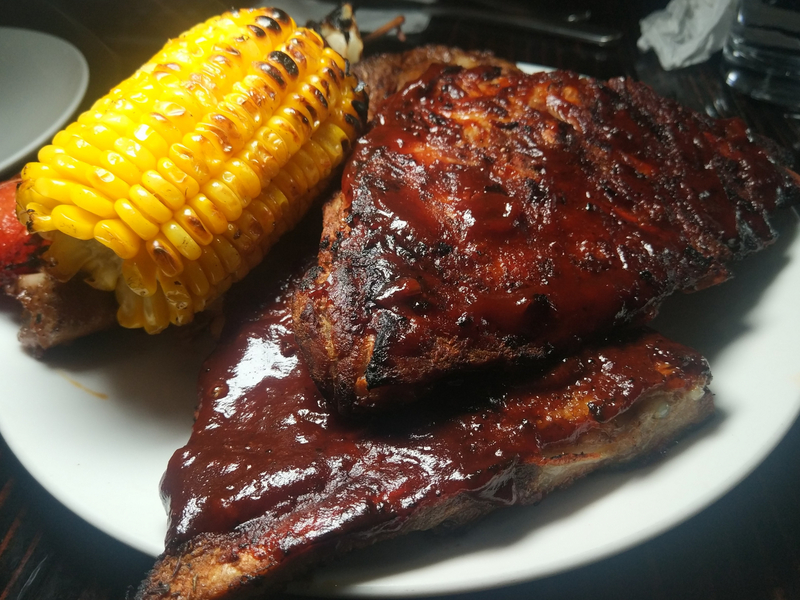 After consulting my ever-helpful Da Zhong Dian Ping, I decided on the "Little Log Cabin" BBQ thanks to its 8.4/10 taste rating and reasonable price point. Both evaluations turned out to be true. Little Log Cabin does its BBQ slightly differently from other kBBQ joints. 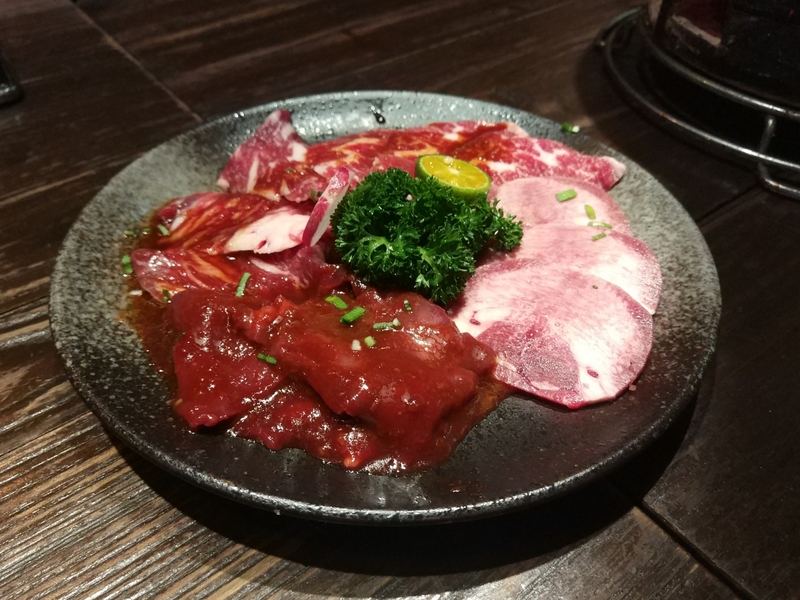 Rather than bringing you the raw meat to your tableside to be grilled on the table, it's mostly cooked already in the kitchen on a big roasting plate, and then the whole thing is brought out to you and set up on a propane burner to finish off to your preferred degree of doneness. The roasting plate is huge and easily holds 3-4 servings of meat plus accompanying veggies and other sides. Basically, instead of roasting the meats one at a time at your table, they're roasting everything at one in the kitchen and hand you the roasting pan as a serving platter/you can keep grilling a bit more if you like. I found this method very convenient, if a little less fun. We ordered the beef combo for 150 CNY. This came with 3？different cuts of beef, along choices of sides including seafood pancake, kimchi pancake, etc... The beef was stacked high on the roasting platter with onions, enoki mushrooms and a single chunk of corn on the cob. None of the beef was marinated in advance, which was a shame, as they will be quite bland, but the dipping sauces were nice and made up the difference. 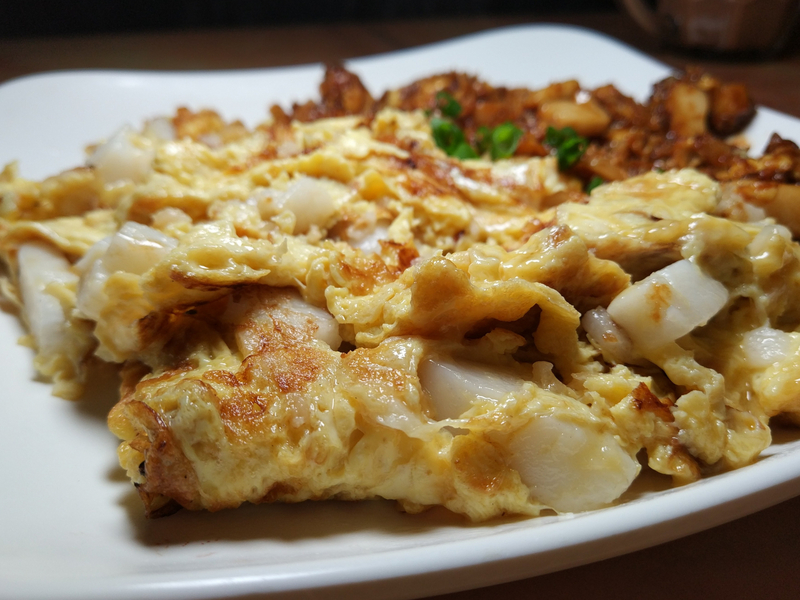 The seafood pancake was very tasty and the dipping sauce that came with it was a perfect match. The beef got tastier the longer it cooked, as it was able to mix with the onions and mushroom juice, which were originally raw on the platter. At the very end of the meal, when I was finally grab charred chunks of the beef, dip in the savory, salty sesame-based sauce, snag a few caramelized onions, a strand or two of the mushrooms, and wrap it all up in a crisp leaf of lettuce, I found myself in a very happy place. 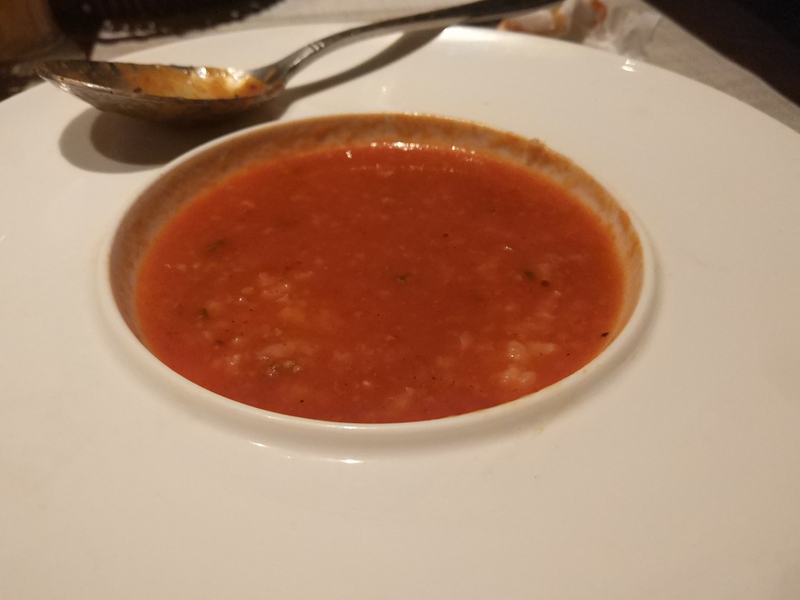 Unfortunately, it took a while to get to that point, and I wasted a lot of room in my stomach with relatively bland beef at the beginning of the meal. Perhaps I should blame my impatience? 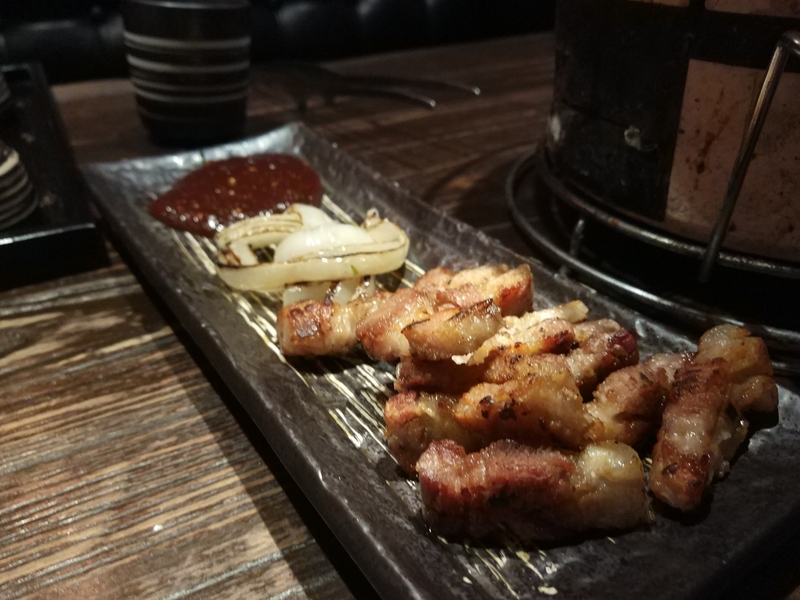 The pork combo was 110 and was an attractive option as well, while the a-la-carte options also seemed very reasonably priced and would be the only way to get marinated/seasoned meats. There was also a coupon available online for more discounts, as it’s a recently opened restaurant, but that coupon was not available during the holiday, alas. We also ordered a big fish cake/seafood soup, which turned out to be too much. The soup itself was nice, with the broth quite flavorful fishy, but the seafood wasn't especially noteworthy by itself and the fish cakes were just fish cakes - I understand they're trendy but I'm sick of them. I'd stick to the BBQ meat here. Overall this place is an easy choice for Korean BBQ in K-town with minimal effort on your own behalf. 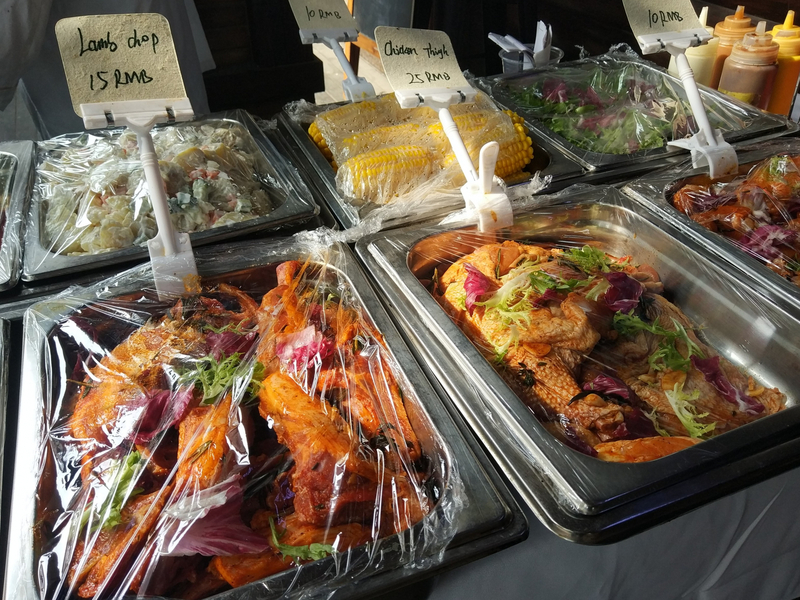 It looks like it'd be a good place to gather a bunch of friends for a get-together too, since they menu has a lot of good drinking & snacking options (fried chicken, rice cakes, beer and soju options abound!) 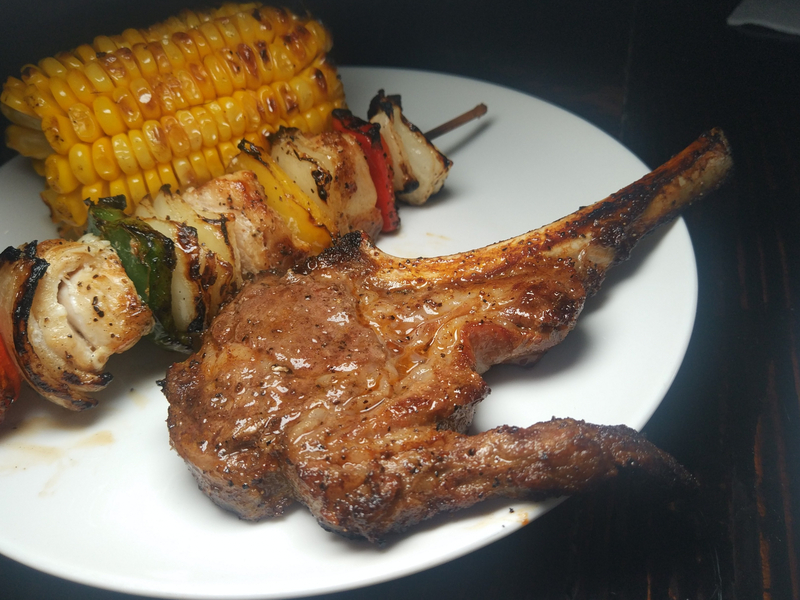 If you start eating the meat direct after it comes out of the kitchen, you probably won’t be impressed by the relatively bland flavors, but I blame that on the non-marinated dishes in the set combo. Also, it must be noted that ordering directly from an online set combo online is usually not the ideal way to sample a restaurant's best effort. In any event, Little Log Cabin slides up to a 4/5 in the final tally, and I’d be happy to sample again the next time I find myself in the neighborhood. I don't like hot pot. There, I said it. I think it's a pain. I think it's messy and takes too long and delivers very poor value on the food. I think most of the flavor comes from the dipping sauces and there's literally no point at all to ordering cheap vs. expensive cuts of meat, since it's all going to taste exactly the same once it comes out of the pot. 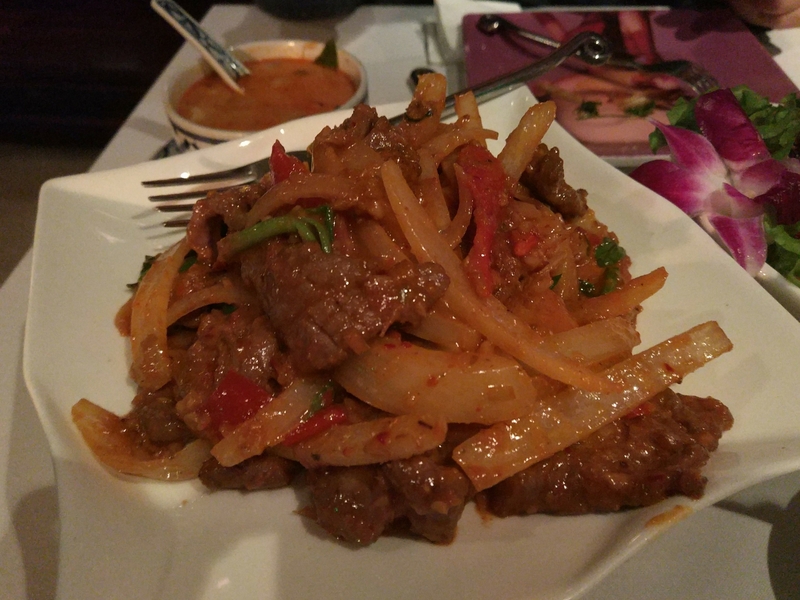 I like Thai food, a lot. It's probably my single favorite world cuisine, and that's saying something, considering how much I love Chinese food. When I noticed Just Thai was making the Chinese foodies go gaga online, I knew I had to give it a try. The main location is over near Da Shi Jie station, just south of People's Square. It has over 24,000 reviews on Da Zhong Dian Ping, with an average score of 9.1/10. It also features 2-3 hour waits. Fortunately, there are a few other locations around town, because franchising is reasonable and good for trendy brands. With just shy of 6000 reviews, the Changshou Rd. location isn't unpopular by any measure, but online intelligence indicated that I was unlikely to experience much of a wait, so we made our way over, and to our delight, were seated immediately. The main choice for your soup uses a Thai twist on the classic Chinese yuan yang guo 鸳鸯锅 (i.e. the two-in-one soup base featuring spicy and clear soups). 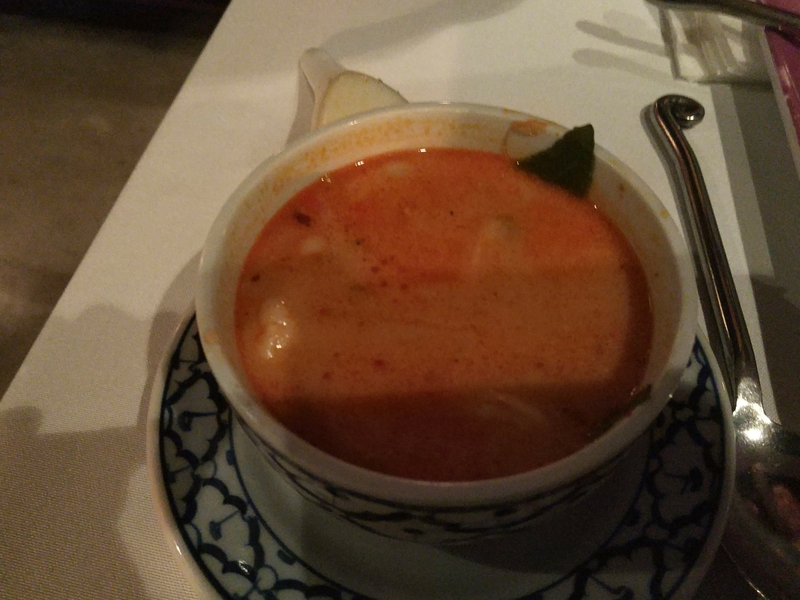 This one had tom yum goong broth on one side and tom kha gai broth on the other side. 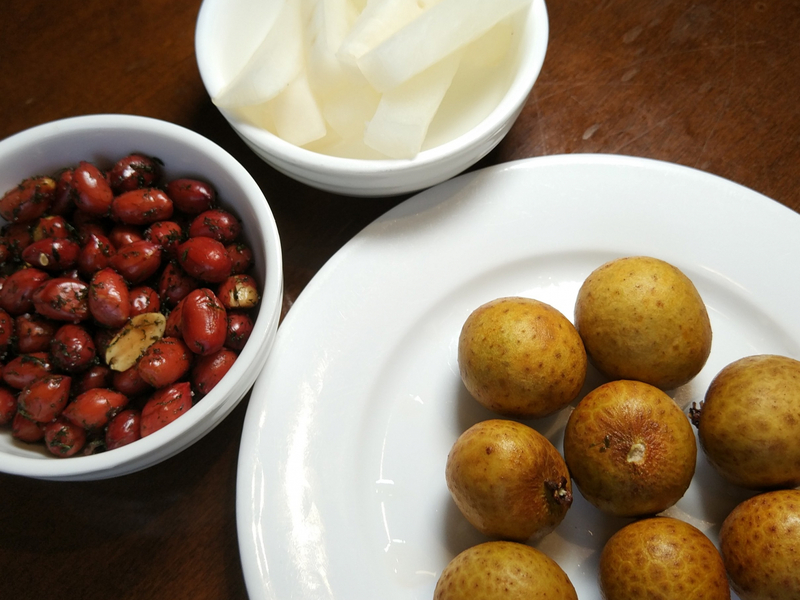 So basically a savory/spicy/sour option and a rich/sweet/coconut option. 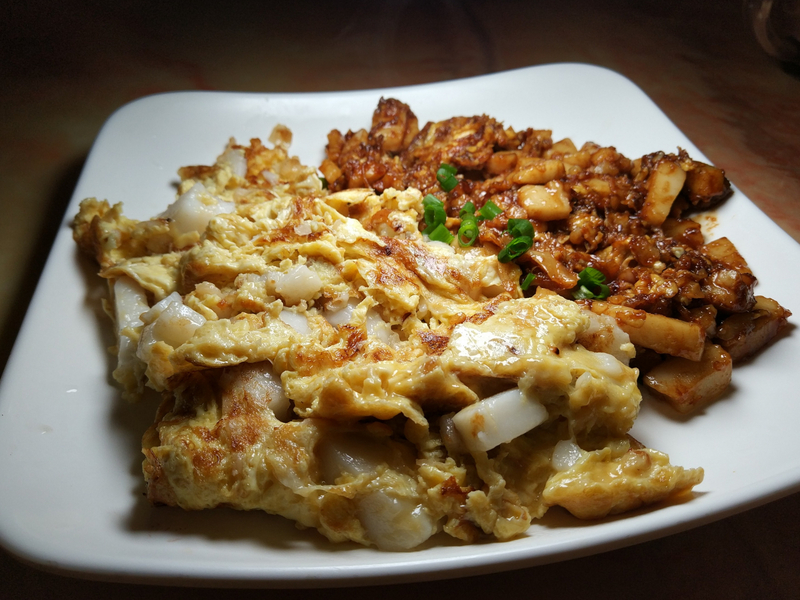 The spicy side was made with seafood, while the coconut side was made with chicken. Before cooking any meat, we tried both sides of the soup. 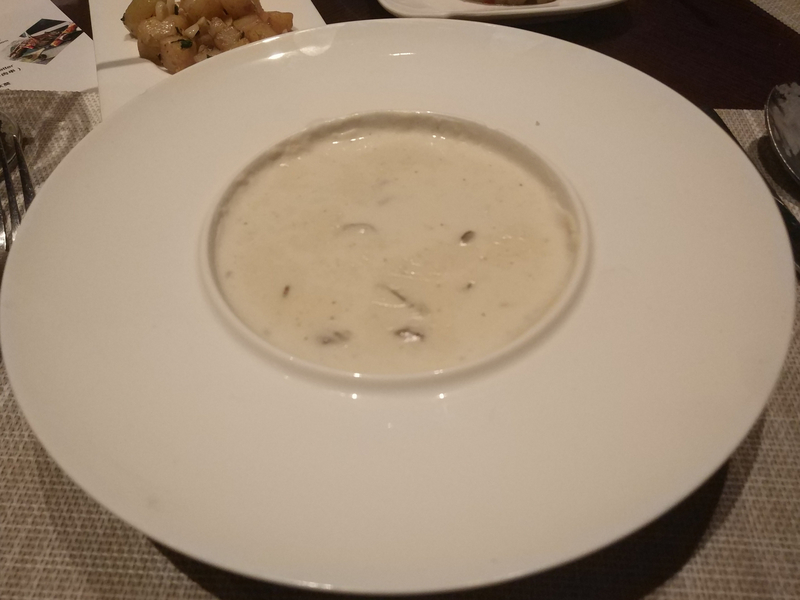 The tom kha gai was really tasty - very rich and sweet with deep complexity of flavor, while the tom yum goong side was more of a disappointment. The flavors didn't seem well integrated - just lemongrass, chili, lime juice. Tom kha gai soup: 8/10. Tom yum goong soup: 4/10. To cook in this broth, we ordered a mixed meat platter, additional fatty beef, some fish roe tofu cakes and spinach along with a Thai milk tea. 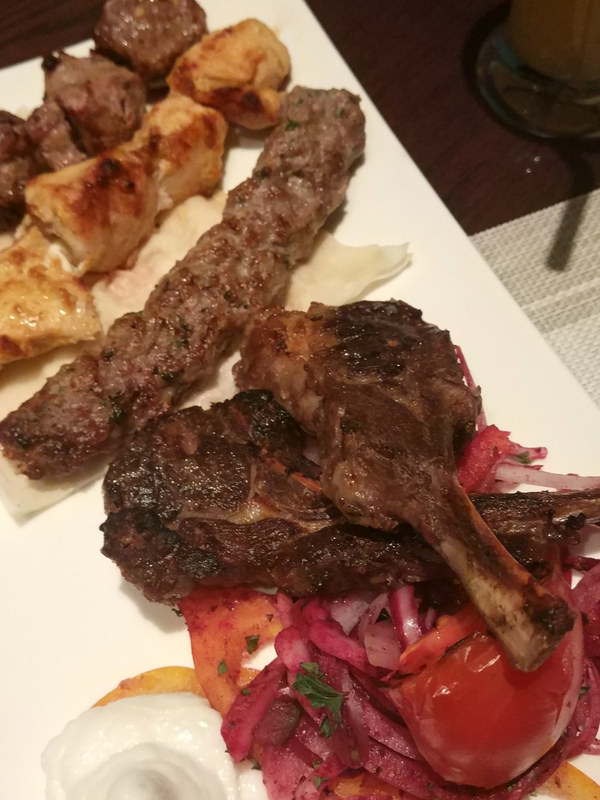 The meat - The mixed platter was a big plate of raw, seasoned meat, split among chicken, beef and pork. All three were marinated, which seemed to matter not at all, because when they came out of the soup, they just tasted like the soup (this is my major complaint about hot pot in general). Fortunately, the soup was pretty good - or at least half of it was anyway. We especially enjoyed treating it directly like a soup and spooning up the broth and the meat together with a spoon, which is something you probably wouldn't normally do with oil-based Chinese hot pot. The side order of fatty beef that had no marinade ended up tasting exactly like the marinated meat. The not-meat - The spinach was totally unremarkable, except for that it took 3x longer to serve than anything else (??). 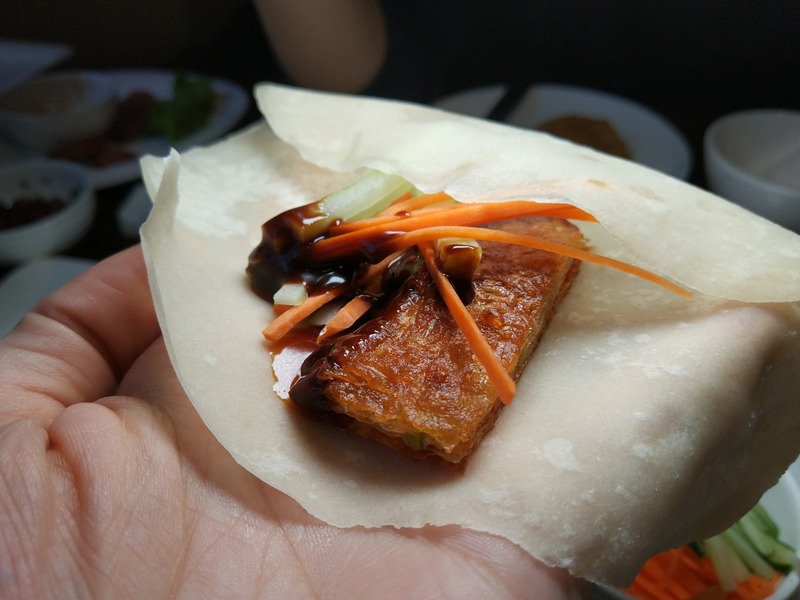 The fish-rose tofu bags were interesting but I only wanted to try one of them, when the minimum order was 4. They had a slightly-fishy taste but were mostly tofu-y in texture, kind of like those Korean fish cakes you can get in some restaurants. 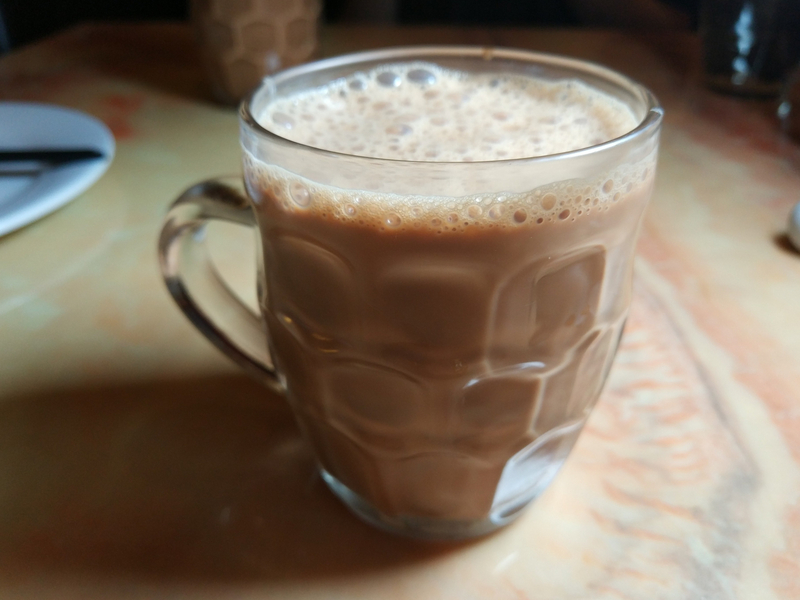 The milk tea - was really good. Some people would probably say it's too sweet, but I like sweet. The dipping sauces - were mostly forgettable. There were three in all: a sweet and sour, a spicy green pepper puree, and a slightly more complex sour/spicy/chili + lemongrass mixture that was definitely the best of the three. Overall: I give the coconut broth an 8/10, the tom yum broth a 4/10 and the experience of eating hot pot a 1/10, because I still don't like eating hot pot. 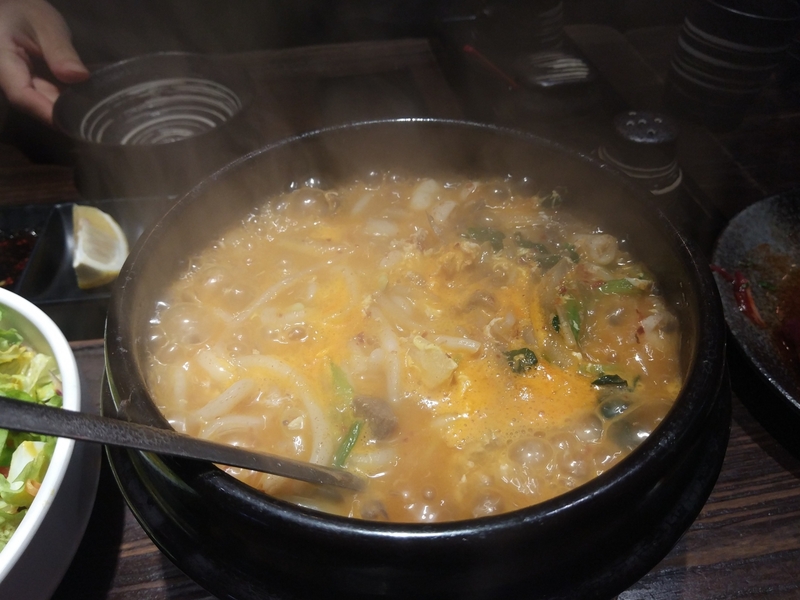 If I went back, I would focus on the coconut broth and treat the whole thing like a big pot of soup into which we can throw everything and then ladle out bowls of soup for each person and ignore the hot pot model of eating. If we can do it like this, I give the whole restaurant a 4/5. I wouldn't wait in line for it, but I might have a craving someday in the future...or maybe bring an out-of-town guest for a creative culinary diversion. I could see it being a good date spot too. Other stuff: Service was disorganized and very busy but nothing egregious...this place is hopping. All ordering happens via QR Code on the table. Price was pretty standard for hot pot, 246 CNY for two people. Let's start with the obvious discussion about the restaurant's location: Kong Yiji is not easy to get to. Your taxi driver isn't going to want to take you there (if he/she) knows the location at all (intersection of Xuegong Rd. and Wenmiao Rd). It's basically southeast of Laoximen Subway Station, down some eternally under-renovation side alleys sipderwebbing between Zhonghua Rd. and Henan South Rd. Your best bet if cabbing it is probably to get dropped off on one of those streets and walk into the alleys. This is a Zhejiang-style restaurant that is especially noted for focusing on crab dishes. Although it's got many pages of standard hangbang cai to admire, the big draw is undoubtedly the pages of crabmeat delicacies, including the crab shizi tou, the crab broth dumplings, crabmeat noodles, and so on. They also have flights of huang jiu for tasting (mellow Chinese rice wine that supposedly has medicinal value, usually in the 14-20% alcohol range). 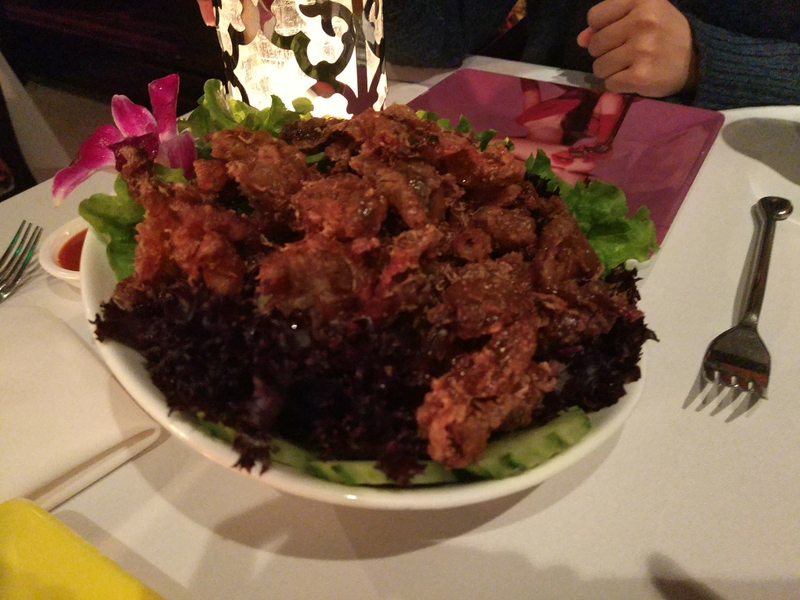 My friend raved about the crabmeat dishes, and although I had been to this restaurant several years ago, I didn't have an especially clear memory of the crab, so I joined her in a party of three to explore the menu. We ordered five dishes: pork belly with cured Chinese cabbage, Shaoxing-style tofu, lion's head meatball with crab, crab dumplings, and a stir-fried green leafy vegetable for color. Lion's head meatball with crab （蟹粉狮子头 I think) - This was the standout of the meal - the meat was steamed well, very flavorful and the crab flavor was strong and fresh throughout both the broth and the shreds of crab meat covering the meatball. The only downside was that the chunks of fat/cartilage inside the meatball were chopped a bit large, so they didn't dissolve entirely inside the cooking meatball. This resulted in sometimes biting down on a hard little nugget of non-dissolved matter inside the meatball (possibly cartilage...). The waiter told us the broth was cooked down from pork shoulderbones, explaining the very rich crab/pork flavor in the juice around the meatball. A very tasty dish. 9/10. Crab roe dumpings (蟹黄混沌）- These were a bit of a disappointment for me. The mini-dumplings themselves were really unremarkable - overcooked to the point where the dumpling skin had lost its elasticity and become mushy, and they didn't have any crab itself in them, just vegetables - while the yellow crab roe broth they were swimming in was just...ok. It had good crab flavor but felt like it was missing some additional depth of flavor or seasoning. While the juice that came with the lion's head meatball was bursting with pork and crab flavor, this broth was really one dimensional (crab) and lacked the umami richness that would have come from using pork bone broth instead of what I assume was just a clear broth + crab roe. Overall - 4/10. 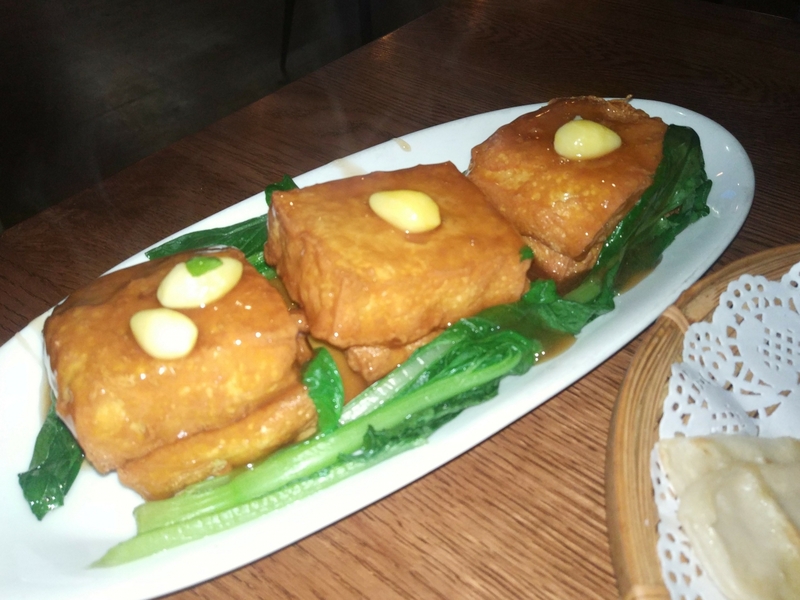 Shaoxing tofu （绍兴豆腐） - Slightly sweet, savory, difficult to go wrong with this dish. These did the trick just fine. 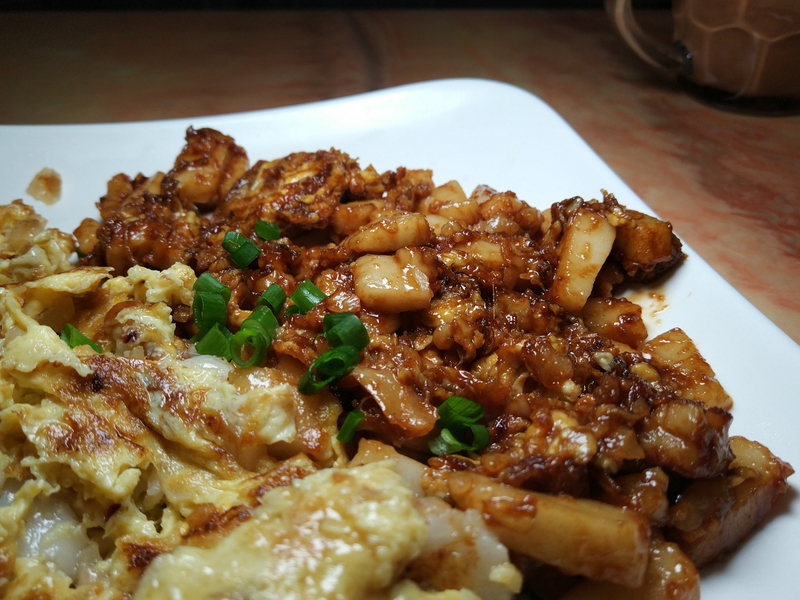 Plus, I seem to remember that it was a very inexpensive dish (something like 22 CNY?). Anyway nothing to complain about here - i'd be surprised for a Zhejiang-style restaurant to mess these up. If you like the sweet-ish food of the region like I do, you'll like these. 8/10. Other stuff: This place is really popular with the locals, so it's always pretty crowded. On busy evenings, you might even half to wait for a seat. It's rowdy, loud, cluttered - if you like that style of Chinese restaurant, you'll like it here. There are three stories in all, with some private rooms on the 2nd and 3rd floor. 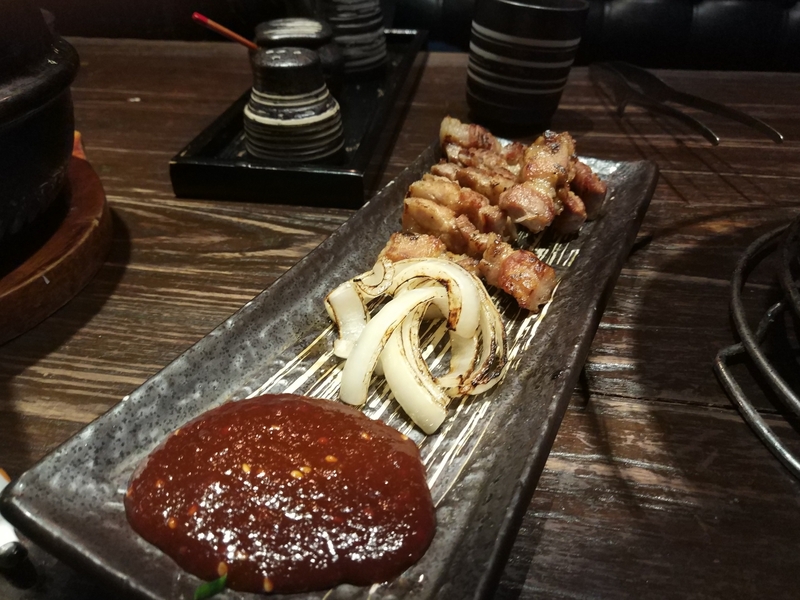 The restaurant's theme is based on a short story by Lu Xun (the name of the restaurant is a character from the short story) and it has signs of the homage throughout the restaurant. On the first floor, for instance, there's a shelf with dozens of carved wooden cups with personalized names on them - a callout to the teahouse in the Lu Xun short story that served their regular guests from personalized cups. Fans of modern Chinese fiction will likely get a kick out of it. 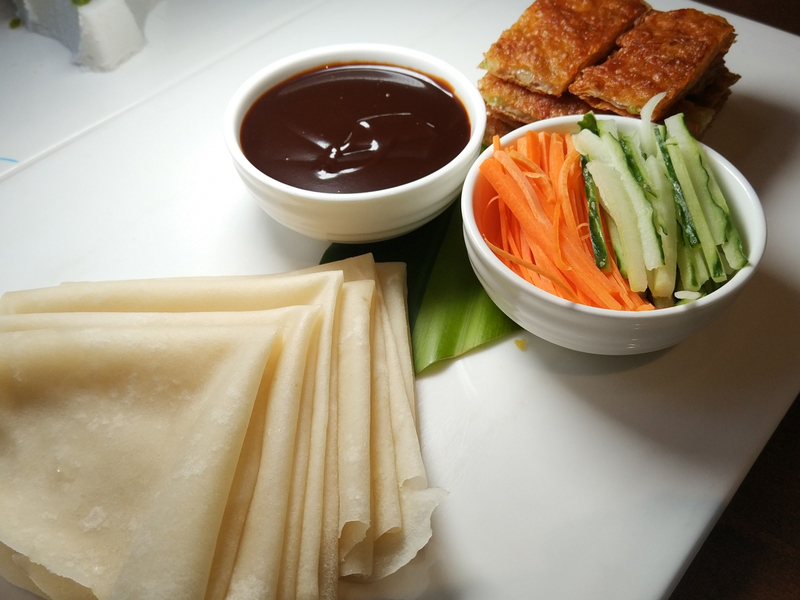 Overall, it's a neat place to take out-of-towners for a raucous regional Chinese feast. There are a few weak points on the menu but I suspect if you stick to the crab dishes and rely on your server for recommendations, you'll end up ordering mostly good stuff and missing the bogies. It's best to check whether it's actually a good season for ordering crab, however, and you'll probably want to make sure that your guests like sweet food. Final score: 4/5. New location, same good stuff! Grano used to my my regular haunt back when I lived over on Madang Rd. It was hard to believe that this one-room restaurant with seating for 5 (squeezing!) 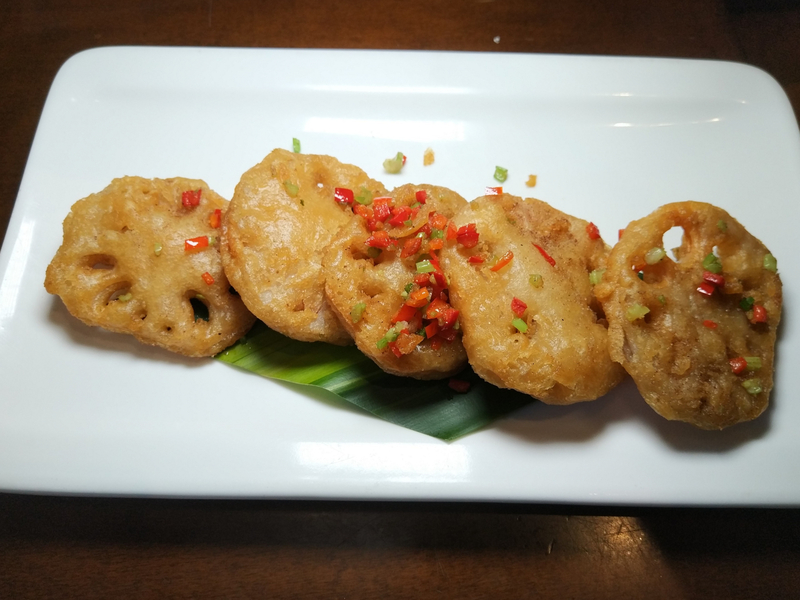 would be able to turn out the quality of the food that it did, but these kinds of oddities are basically par for the course in Shanghai dining. Facing a 40% hike in rent for the Madang Road location, the owner finally closed her Madang Rd. location for good, choosing to focus on her newly-opened second location, which is now her only location. It's now located over on Xinhua Road, close to Dingxi Road. For those of you needing a point of reference, it's just around the corner from that F&B development where the first Pie Society is located. Grano owner Skyli used to work in a fancier Italian restaurant in town before bringing her her knowledge and love of simple italian cafe food to Grano, along with some very attractive prices. The made-to-order pizzas are the most expensive things on the menu, in the 80-100 CNY range. 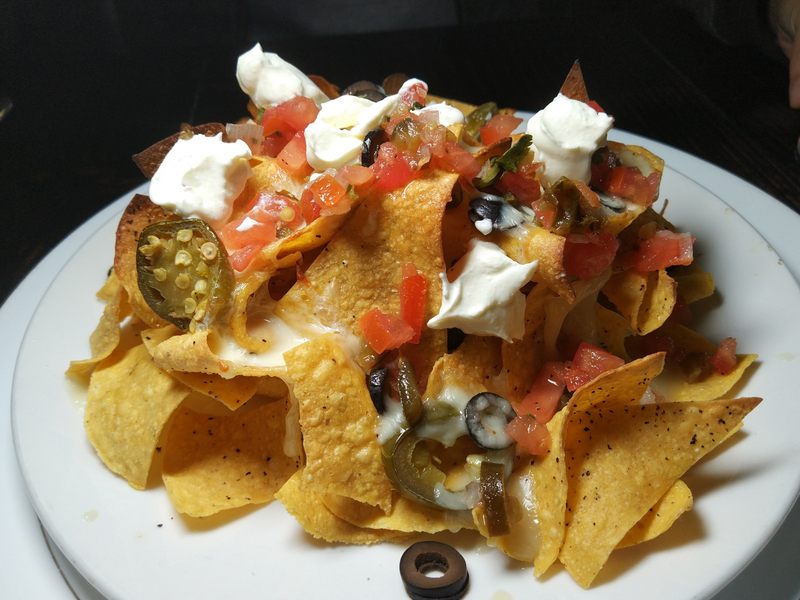 The rest of the menu features salads, pastas, snacks and a single oddity - the quesadillas (which are delicous but admittedly not Italian...) along with a nice beer, coffee, wine and soft drinks selection. This new location also has a lot more space for seating than the old location, including some outdoor seating (although you'll have to risk going deaf from the store next store selling cured meats via their microphone loudspeaker rattling off an endless 30-second promotional loop). For specific meal recommendations, I would say you can't go wrong with the chicken avocado salad - this has been my go-to light meal for years at Grano. The serving size is generous, the price point is very attractive (40 CNY I believe) and the seasoning is really excellent. Other highlights include the homemade Italian-style pizza, of course, the lasagna (on days that they have it...not every day!) and the homemade tiramisu (again, they don't have it every day...ask the owner when you arrive). With Shanghai's glut of celebrity chefs, superlative luxury ingredients and eye-popping prices, a friendly, casual neighborhood cafe like Grano is truly appreciated. 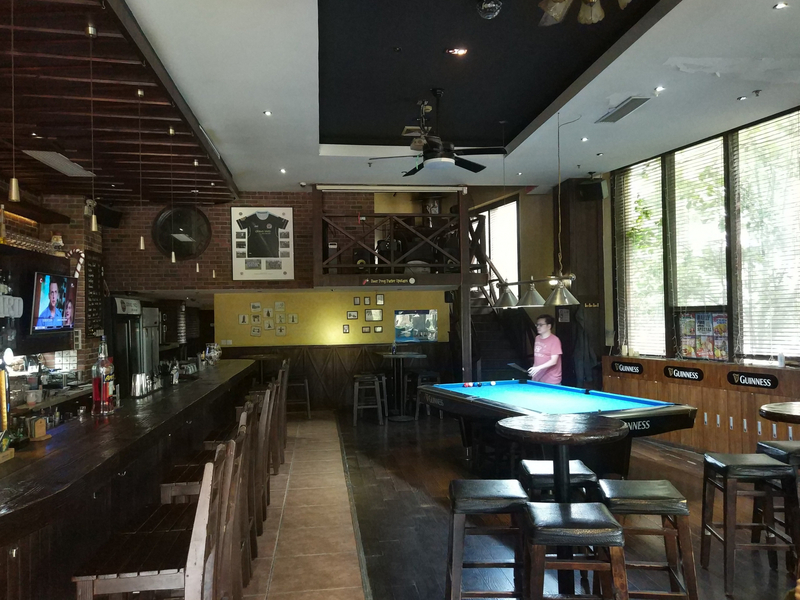 I wholeheartedly recommend to anyone looking to grab a light lunch or a casual drink in the Jiaotong Unviersity - Zhongshan Park middle ground neighborhood. Grab a sidewalk table and order yourself a drink. Slow down the pace of life a little. Get some tasty nibbles and linger. You'll be glad you did. Just watch out for the microphone blasting next door. On my last visit we shared drinks, a salad and a main, and the total came out to about 130 CNY. 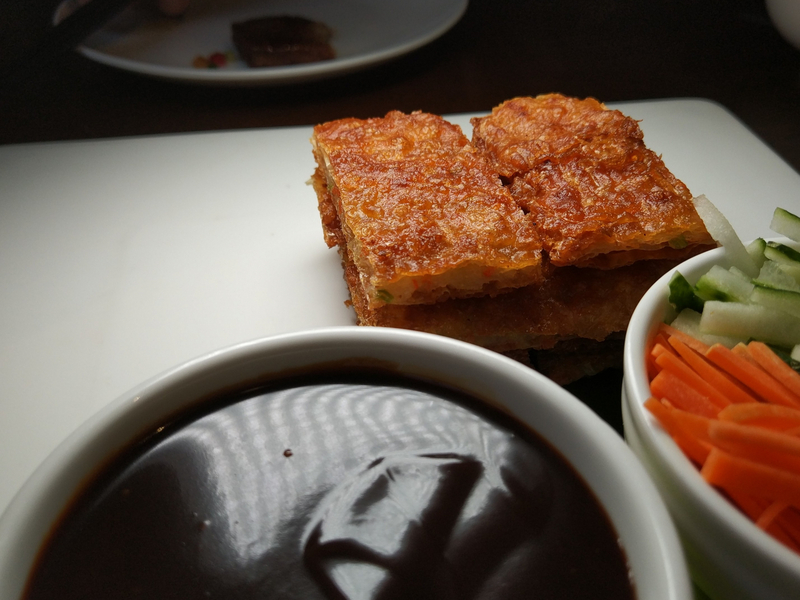 The day after my attempt to visit Bumbu resulted in a negative experience at Spiceee (see previous review), I was still craving Indonesian cuisine. Thus, we made our way to the only place left in town able to scratch that itch: Bali Bistro on Wanhangdu Rd. I'd been there before and had enjoyed everything, so I was prepared to be satisfied again. Fortunately, my expectations were happily met! The satay platter had two skewers each of four different kinds of meat (chicken, pork, beef, something?). The flavor on the skewers themselves was pretty good, but the real star here was the dipping sauce - from the classic peanut-based satay dipping sauce to the spicier soy-based dipper sauce, all three dipping options were very good. The only ding here was the price : 88 rmb for 8 skewers isn't that expensive, but still significantly more than the other dishes on the table, although they tasted better. Overally not a bad choice, but I probably wouldn't get again. 7/10. The fried rice was tasty and also came with another three skewers (pork, chicken, beef). I also liked that it came with some fresh veggies to cleanse out my palate between bites. The sunny-side up fried egg on top of the rice was not quite as gooey as I would like, but at least it was still soft. 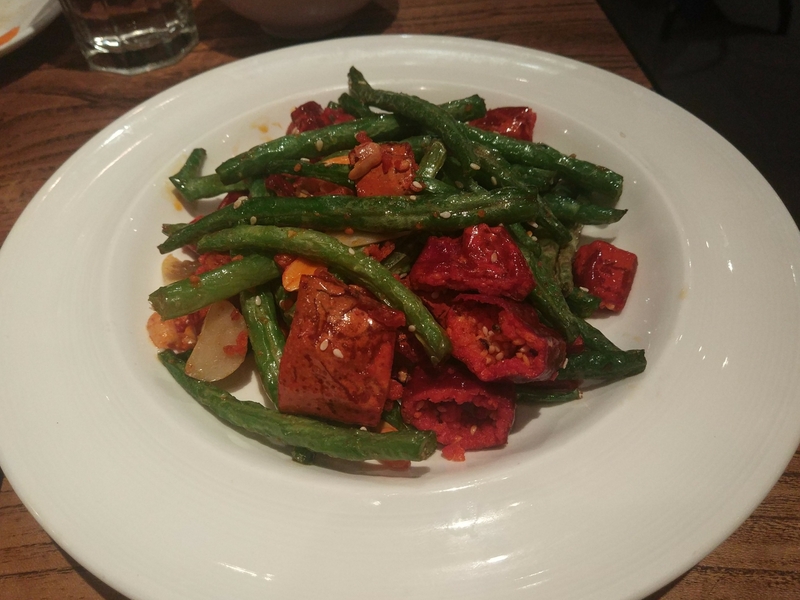 According to some reviewers on Bon App, this dish is supposed to be spicy, and it was a point of disappointment for them that it was not. 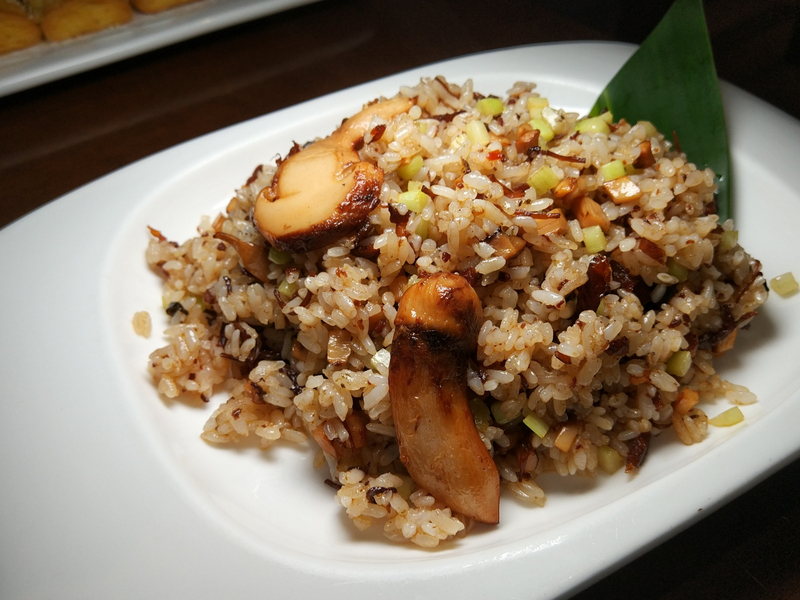 Not having tried the spicier version of this dish, I felt this fried rice was just fine. Above average tasty and nothing to really complain about from me. 8/10. Other stuff: decor is cute if a bit kitchsy, but not overtly so. You could still have a nice dinner here without feeling like you're in a tourist trap. Try to get a table near the window, over looking Wanhangdu Road, as this has better ambience. There were two tables of what looked like Indonesian people eating near us, so this was a good sign. Service was fast with the water refills, although they did have to be reminded. Final damage was about 250 CNY, which is way more than reasonable for the quality of the meal and the area. Will definitely be back. Located in the basement of an office building at the intersection of Nanjing West Road and Chengdu North Road and apparently catering to the office lunch crowd, Spiceee offers a mix of Southeast Asian classics including curries, laksa and Hainan chicken in lunch set form. It occupies the space immediately to the left of the (sadly) now-closed Bumbu. We didn't know Bumbu was closed, making our way there for a Saturday lunch only to be sadly disappointed by 'renovation-in-progress'. We were hungry, craving SE Asian flavors, and Spiceee was right there, so we thought "well why not...?" Unfortunately, by the end of the meal at Spiceee, we had plenty of responses to the question "why not?" As we entered, the guy behind the counter looked at us so blankly, it waslike he couldn't believe we had just entered the restaurant (worth pointing out it was 1:30 PM on a Saturday). After confirming that they were in fact still serving dishes with our frigid/spaced out server, we were able to place our orders at the counter and headed for a seat to wait for our food. 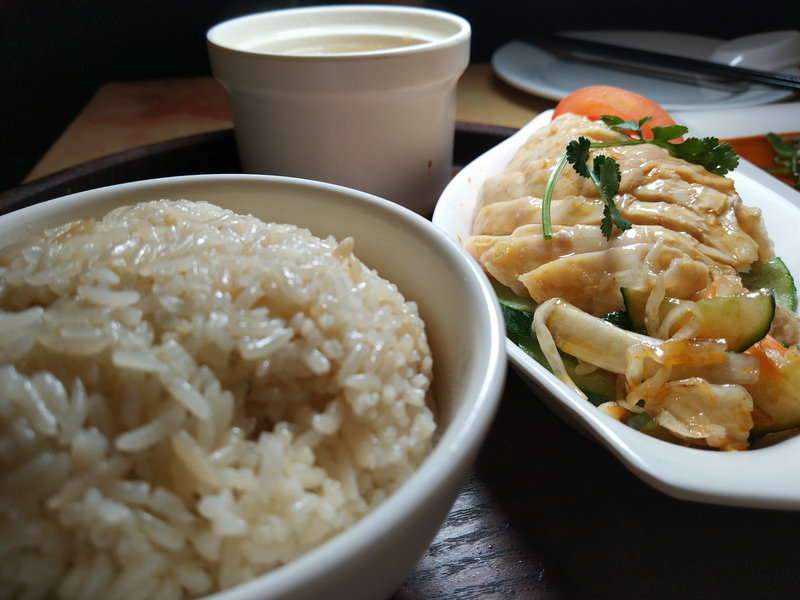 We tried to stick to their recommendations, ending up with a seafood laksa, Hainan chicken with rice, stir-fried morning glory and veggie spring rolls. Food came out one at a time, with 10-15 minutes of ordering. Seafood laksa: Looked lovely, but that's all the positive I can say about it, as it was utterly devoid of flavor. I wish I could criticize it by saying it tasted like instant noodle laksa, but honestly those instant noodle laksa have more seasoning that this one did, even if it is mainly MSG. Aside from the blandness, there was nearly no seafood in the dish. After hunting through the entire bowl, we found one piece of fish cake and two tiny shrimp to comprise the "seafood" portion of the laksa. The shrimp were previously frozen, terribly overcooked, and probably would have bounced had I dropped one on the floor. Final score 3/10. 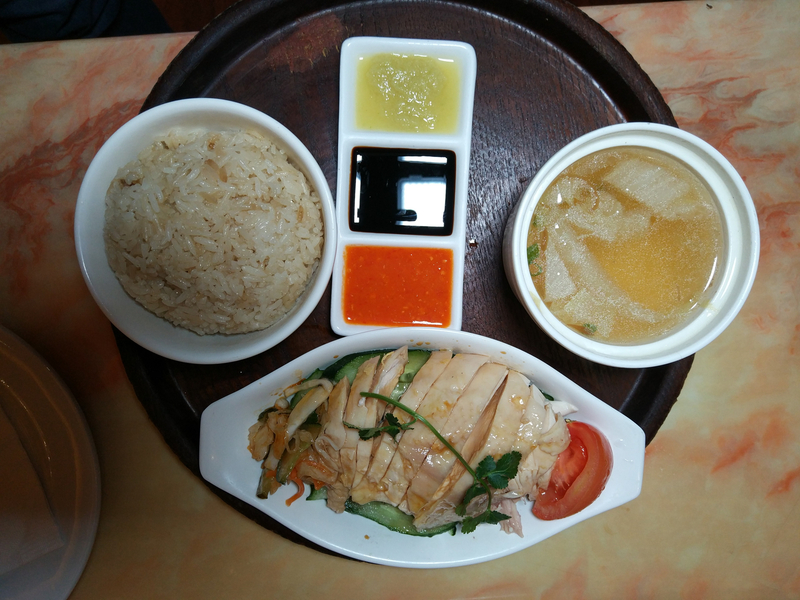 (I won't give it lower, because it didn't taste BAD - it just tasted like nothing) Hainan chicken: The flavor on the chicken was ok, but the fat layer on the chicken was a bit too thick. It if was very fresh, flavorful chicken, perhaps you can get away with a thick fat layer like this, but instead it just felt greasy and not light at all. The rice was drizzled with a sweet soy-based dipped sauce, instead of a glazing of chicken fat, but I found it bland. The sauce provided on the side was a good complement for the chicken for dipping, but it also seemed it like came out of a jar. Overall, a tad bit better than the laksa, but very uninspiring. 4/10. 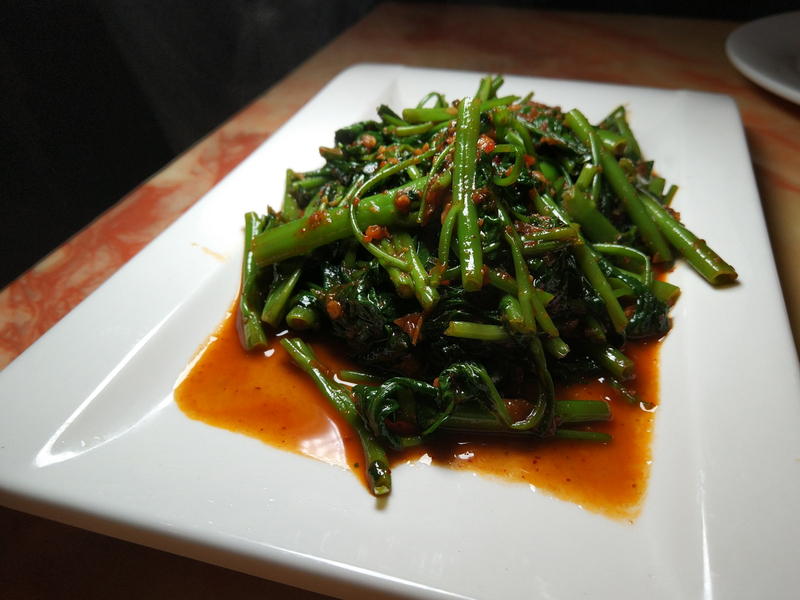 Stir-fried morning glory: It was just morning glory wok-tossed in a sweet/spicy sambal-esque sauce. It tasted like that sauce. It wasn't bad, nor was it especially memorable. Eat your greens people. 6/10. Fried spring rolls: Nice crispy fried skin on these, not too oily, shredded cabbage/carrot inside juicy and fresh-tasting. The sweet and sour sauce provided for dipping tasted exactly like sweet and sour sauce at any takeout Chinese place in the States. Actually, so did the fried spring rolls. They were decent - nothing remarkable but nothing wrong with them either. 6/10. 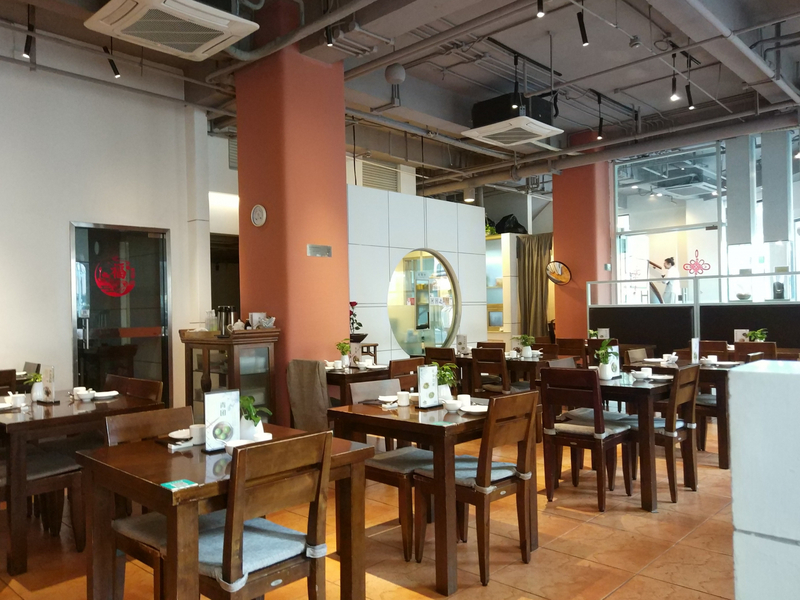 Occupying the space immediately to the left of the Taixing Road Sproutworks, casual Indian dining spot Currify x Taoker landed in the Wujiang Road/Taixing Road dining hub in late July. It was packed when we (party of 2) arrived at 9pm on a Thursday, with a fairly young customer base, about 50/50 Chinese and laowai. We grabbed a number but were seated after just a few minutes' wait. The restaurant is split into two sections, with high chair bar-style tables near the entrance and standard table seating in the back area. We got a table at the high seats near the door, but I'd recommend going for the seating in the back if you can - there was a lot of movement around the door and the AC was losing the battle. Ambience-wise, the restaurant lighting felt a bit too dark for me - like it was straddling the line between restaurant and bar without quite committing in either direction. Perhaps my awkward choice of dining time had something to do with that. Flat screens on the walls were showing Bollywood movies. The specialty here is the Southern Indian staple: the dosa - specifically the potato dosa (masala dosa). We ordered a serving of masala dosa, along with palak paneer, butter chicken, and draught beers. The palak paneer and butter chicken both came with plain naan, so we didn't have to order those, which was nice. They were running a BOGO offer on the beers that night, but our server forgot to tell us until we were leaving, so the freebies ended up wasted - tragedy! The masala dosa arrived first - I was most excited to try this, but I was a bit underwhelmed. The pancake portion of the dosa was nice and crispy but I found the potato filling a little underseasoned and somewhat on the skimpy side to boot. A bit of post-meal research informed me that a classic masala dosa is supposed to be relatively lightly seasoned, so perhaps my evaluation needs to be taken with a grain of salt, but I definitely would like liked a bit more depth of flavor. There are three sauces/chutneys that come with the dosa for dipping and they definitely helped. Not an expert on dosas, but I felt this could have been more. 6/10. The palak paneer and butter chicken arrived at about the same time with their accompanying naans. The palak paneer was tasty enough but I found the texture of the spinach a bit strange -very thick and creamy with almost no textured mouthfeel at all, like it had been blitzed in a food processor for too long. It reminded me of the difference between homemade guacamole and store-bought guacamole - homemade guac usually has uneven chunks of avocado in the mix, while store-bought guac has an uncannily uniform texture throughout. The paneer in the dish was plentiful, although I would have liked it cut into larger chunks. Taste-wise, the dish was okay, but I've definitely had better. 6/10. The butter chicken on the other hand tasted nothing like any butter chicken I've ever had in my life. The predominant flavor in the butter chicken, as far as I could tell, was pumpkin. Not a little pumpkin - a LOT of pumpkin. I thought I was crazy. I had my girlfriend try it. She agreed...definitely pumpkin...so maybe we are both crazy. It was a rich, sweet + spicy pumpkiny butter chicken. Now my surprise here should not be taken as disapproval. I didn't hate it...in fact I rather liked it. The chicken portion was generous and the flavors aside from the pumpkin was very good. However, this is NOT the dish to order if you've been craving a classic, rich, savory butter chicken. For me, this was an 8/10, but I could definitely see other people giving it a 2/10. Other stuff: The naan was good - warm, crispy and chewy, just like it's supposed to be. Service was disorganized and made a few mistakes - we initially got someone else's mains, the beers arrived after the food, an extra beer was added onto our tab and had to be removed - can't be sure if this is par for the course or if we got bad luck with our server. The price was very reasonable for the neighborhood: 55-70 for mains and bottle and draught beers from 35-60. Looks like they also had a decently-sized bar with a fair number of whiskeys. Currify x Taoker probably deserves a second chance with different dishes, perhaps in a month or two when they've had a little bit longer to standardize their operation. The attractive location and price point pretty much ensures I'll be back at some point and I didn't get a chance to try anything from the tandoor portion of the menu this time, so I'll withhold final judgment for now.